This article analyzes the waterbodies and drainage basins situated within the District of Algoma's Great Lakes drainage basin with a focus on freshwater charr (i.e., lake charr [Salvelinus namaycush] and brook charr [Salvelinus fontinalis]). Northern Ontario, where the District of Algoma is situated, is one of the two most general sub-provincial geographical and administrative divisions within the province of Ontario. These two divisions contrast markedly from each other with Northern Ontario constituting 87% of the province's land area but only 6% of the population. It is divided up into large, sparsely populated administrative districts opposed to the smaller and more densely populated administrative counties which constitute Southern Ontario. The boundaries of the province of Ontario are highlighted in red. 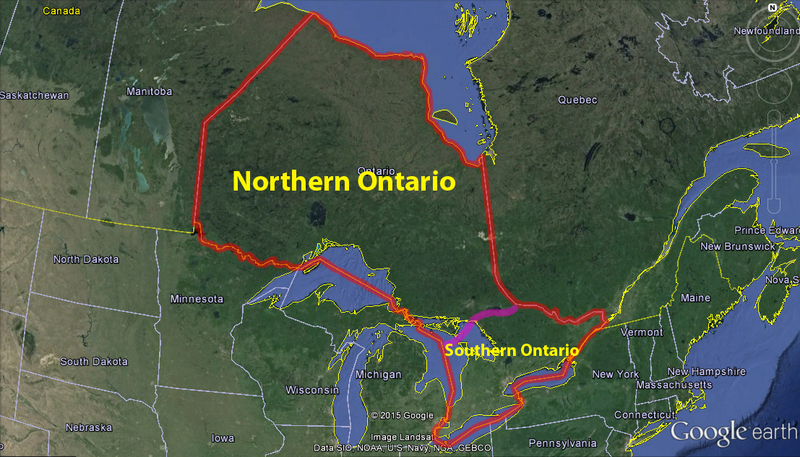 The approximate division between Northern Ontario and Southern Ontario is demarcated in purple. Background imagery from Google Earth. Although Sault Ste. Marie is Algoma's seat and is a sizable city containing around 75,000 inhabitants, the district contains 48,810.68 km2 of land and contains only around six other places that possess more than 1,000 inhabitants. Altogether, according to the 2011 census, the district was home to 115,870 inhabitants. If Algoma was a country, it would rank as the second least densely populated country (2.4 people/km2) in the world only ahead of Mongolia (1.9 people/km2). Within the six municipalities that contain more than 1,000 inhabitants, together they constitute 95,342 inhabitants and 82.3% of the total population of the district. With most of the population residing within these places, this means that the majority of the vast territory comprising the district is uninhabited. It is mostly wilderness. 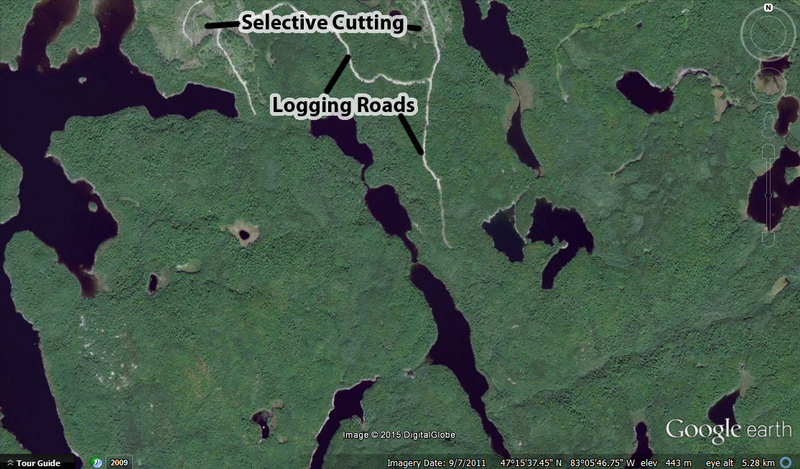 Wilderness spotted with logging, mining, a handful of cottages, and a fishing lodge or two. It is a place where the local residents long for the services of more densely populated areas and where visitors excitedly embark on their adventures. The District of Algoma and its immediate neighbours. The brightest area surrounded by the purple line demarcates the catchment area of all of the streams that empty into the Great Lakes within Algoma. Many of them are long resulting in some overlap into neighbouring districts, primarily that of Sudbury. North of the thick red line is Canada and to the south is the United States, with the state of Michigan being immediately across the border. Wisconsin is present in the extreme bottom left of the image. Background imagery from Google Earth. The portion of the district that drains into the Great Lakes is characterized by both ancient mountains that have been weathered down over billions of years by glaciation and by the multitude of waterbodies and beaver ponds spattered across the landscape. Many of the waterbodies and beaver ponds within the Great Lakes drainage basin contain highly sought after brook charr and lake charr, both prized by sport fishermen and the later also being prized commercially. This rugged and dynamic landscape has inspired impressionistic painters like the famous Group of Seven. Satellite imagery showcasing the dynamic landscape of Algoma along with its many waterbodies. 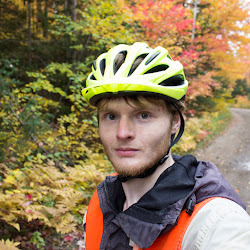 The orange colouration is due to the fall colours present when the imagery was taken. Background imagery from Google Earth. As with the other articles that I produce, this article is a work in progress. I will be expanding and updating it over time. The Ontario Ministry of Natural Resources (OMNR) was the primary source for nearly all of the data aggregated in this article. Maps from the National Topographic System , produced by the federal government, were used to help locate waterbodies, streams, and stream courses. Land use guideline manuals  , produced by the OMNR, were used to identify which waterbodies contained brook charr, lake charr, and if lake charr were present, what class, if any, the waterbody was designated as. These manuals also provided some data regarding the numbered waterbodies. A website called "Fish ON-Line" , which is also produced by the OMNR, was also used to help identify brook charr and lake charr waterbodies, maximum waterbody depths, waterbody names and numbers, and stream courses. Finally, "The Great Outdoors Map", produced by MITIG Forest Services Ltd , was used to help identify more lakes based on species whether a name or number were present or not. This last source only covered the Sault Ste. Marie and Blind River OMNR administrative districts and not the other ones analyzed in this article so these districts will have more coverage in this article's data. There are many issues that arise when aggregating data for these waterbodies. Many waterbodies, especially those that are small, intermittent beaver ponds, or are very difficult to access, are unnamed and as a result, are excluded from the data in this article. The OMNR does number or give unofficial names to some waterbodies, especially if they have stocked them with fish, but despite this, many waterbodies are still left unnamed and are subsequently excluded from this article. Many of the waterbodies that the OMNR does number or unofficially name are identified with inaccurate coordinates meaning that it was necessary to approximate which waterbody was being referred to. Due to a great deal of ambiguity present in the reports used in the aggregation of this data, some numbered waterbodies were excluded if they lacked both coordinates and an identification as to which township they were situated in. Not only are there many unnamed waterbodies that are excluded from the data analyzed in this article, many of the named waterbodies haven't been surveyed to provide data as to what fish species are present or as to how deep the waterbody is. Due to these limitations, this article can only do its best to approach an idea of the area surveyed. The satellite imagery in the figure below showcases a part of the upper reaches of the Mississagi River drainage basin and how none of the waterbodies included in the view have any official or unofficial OMNR names. The upper reaches of the Mississagi River drainage basin. 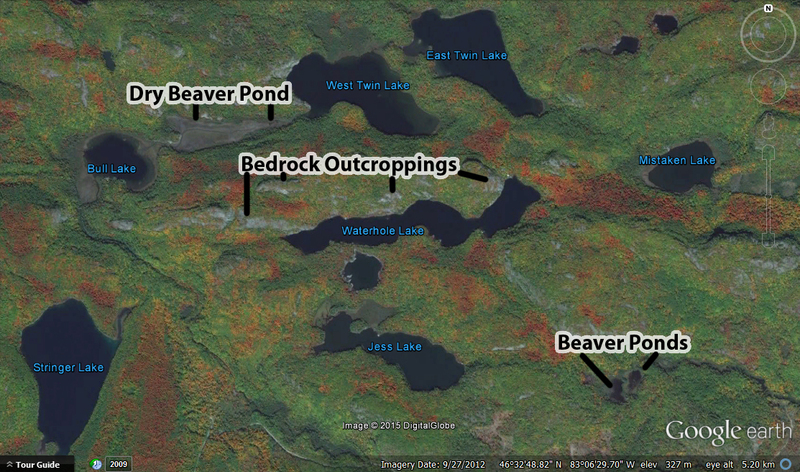 None of these waterbodies are named. Background imagery from Google Earth. Nearly every waterbody within the area analyzed in this article is drained by a stream that eventually reaches either Lake Superior or Lake Huron which themselves are subsequently drained by a network of rivers to the ocean. In aggregating data for the streams that drain these waterbodies, a similar naming issue arises in that many streams are also unnamed and subsequently excluded from the data in this article. 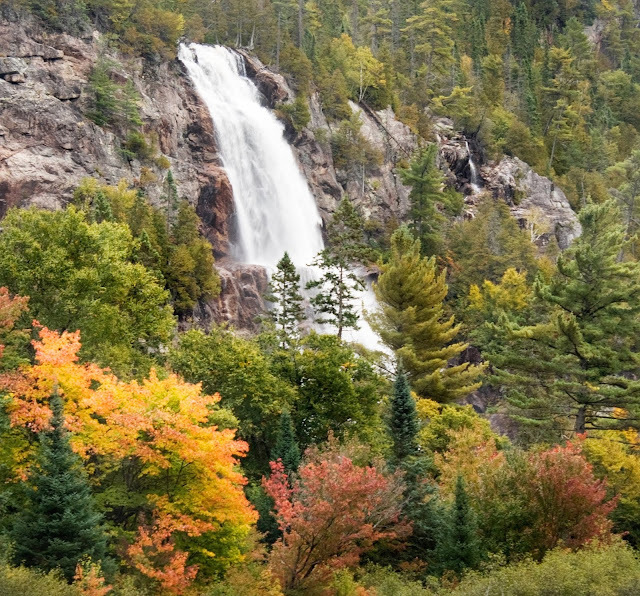 Bridal Veil Falls occurs on an unnamed stream that drops into the Agawa Canyon and directly into the Agawa River which subsequently flows into Lake Superior. Photo taken by Billy Wilson (me). This section describes what each header on the population table in section 5 stands for from left to right. Indicated in parenthesis is what a header's short form stands for. Waterbody: The name waterbody. Official gazetteer names take precedent over other names. [former names], (other names). Township: The name of the township that the waterbody is mostly situated in. Many waterbodies can stretch over more than one township, especially if they are situated where four townships intersect. OMNR District (Ontario Ministry of Natural Resources District): The name of the resource management district that the waterbody is situated in. District: The name of the political administrative district that the waterbody is situated in. Great Lake: The name of the Great Lake that the waterbody ultimately drains into. There are only three possible entries for this column; Lake Superior, Lake Huron (inclusive of streams that empty into the St. Marys River), or Inland. "Inland" means that there isn't any known surface drainage from the waterbody. For reference regarding the stream nomenclature system, see the figure at the end of this section. Primary Stream: The name of the stream that empties into one of the Great Lakes that the waterbody drains into. Secondary Stream: If a named stream exists before the water from the waterbody's outlet reaches the primary stream that empties into the Great Lakes, its name is stated here. Tertiary Stream: If a named stream exists before the water from the waterbody's outlet reaches the secondary stream, its name is stated here. Quaternary Stream: If a named stream exists before the water from the waterbody's outlet reaches the tertiary stream, its name is stated here. Quinary Stream: If a named stream exists before the water from the waterbody's outlet reaches the quaternary stream, its name is stated here. Senary Stream: If a named stream exists before the water from the waterbody's outlet reaches the quinary stream, its name is stated here. Max Depth Metres (Maximum Depth in Metres: The maximum depth of the waterbody in metres. Max Depth Feet (Maximum Depth in Feet): The maximum depth of the waterbody in feet. Lake Charr: An indication as to whether or not the fish species is present in the waterbody. Some are classified by the OMNR as A1, A2, B1, B2, and C which reflect their productivity in regards to this fish species. These categories are further explained in section 5.2. "N/P" means "not present". Brook Charr: An indication as to whether or not the fish species is present in the waterbody. 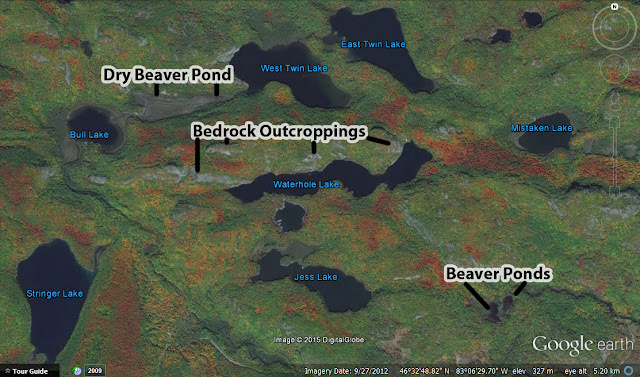 The OMNR designates some of waterbodies as containing primarily brook trout. Where this information was available, this is indicated in this column. "N/P" means "not present". Splake: An indication as to whether or not the fish species is present in the waterbody. "N/P" means "not present". Rainbow Trout: An indication as to whether or not the fish species is present in the waterbody. "N/P" means "not present". Brown Trout: An indication as to whether or not the fish species is present in the waterbody. "N/P" means "not present". An illustration to help visualize this article's nomenclature system used for streams. You can liken it to a tree. For this tree, the Great Lakes are the ground and the primary stream acts as the trunk. 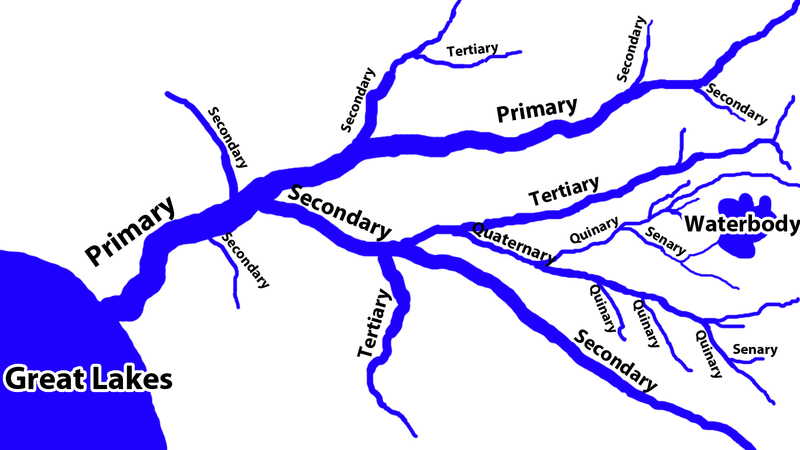 A secondary stream is any stream feeding into the primary stream, a tertiary stream is any stream feeding into a secondary stream, and so on. Within this section is one interactive table and one interactive Google Map. The table has its own independent scroll bars, one on the bottom and one on the right of its interface. You can use them to navigate from column to column and row to row. You can also click on the different headers to sort by them. Beneath the table is the interactive Google Map, close by to allow one to go back and forth easily. Mississagi and East to Edge of Algoma. The fifth layer is the most recently added one and contains waterbodies that do not possess a name or number. The data for this layer came from The Great Outdoors Map . To begin with, a few interesting observations. 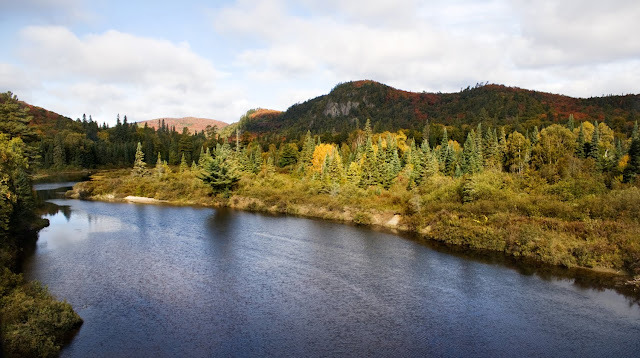 The Marshland River which drains Elliot Lake and numerous other waterbodies is one of the only streams analyzed in the data where a river flows into or becomes a creek. In this case, the Marshland River becomes McCarthy Creek which subsequently flows into the Serpent River. The Sister River, which notably drains Rawhide Lake, is called "Red Deer Creek" during a very tiny length of its course between Rottier Lake and McElrea Lake in Viel Township. Names are typically continuous and almost never change to something else and then revert back to a previous name during the course of the same stream. The Batchawana River photographed from the railroad crossing. Photo taken by Billy Wilson (me). Below is a pie chart depicting how many waterbodies flow into each Great Lake. The raw figures were as follows, Lake Superior: 1,490; Lake Huron: 1,279; and Inland: 23. Pie chart of the distribution of drainage flowing into Lake Superior, Lake Huron, and what is isolated inland. Below is a table listing all of the primary streams, which Great Lake they flow into, and how many waterbodies each primary stream drains. Below is a table listing all of the secondary streams, the primary stream each one flows into, the Great Lake they eventually flow into, and how many waterbodies each secondary stream drains. Below is a table listing all of the tertiary streams, the secondary and primary stream each one flows into, the Great Lake they eventually flow into, and how many waterbodies each tertiary stream drains. Below is a table listing all of the quaternary streams; the tertiary, secondary, and primary stream each one flows into; the Great Lake they eventually flow into; and how many waterbodies each quaternary stream drains. Below is a table listing all of the quinary streams; the quaternary, tertiary, secondary, and primary stream each one flows into; the Great Lake they eventually flow into; and how many waterbodies each quinary stream drains. Below is a table listing all of the senary streams; the quinary, quaternary, tertiary, secondary, and primary stream each one flows into; the Great Lake they eventually flow into; and how many waterbodies each senary stream drains. A major thing that affects the number of waterbodies drained for secondary streams and subsequently lower orders of streams (i.e., tertiary, quaternary, etc.) is the frequency of how often stream names change. For instance, Crooked Creek, drains McGiverin Lake and flows into Granary Lake who's outflow is named Granary Creek. Crooked Creek and Granary Creek could have been given the same single name which would have resulted in a combined figure for how many streams are drained, but instead since they are named differently, they are totaled separately. It is also important to keep in mind that the number of waterbodies drained isn't an absolute measurement regarding the size or prominence of a stream. It is however an attribute that can allow for some comparison. Also, keep in mind the limitations of this data. Not all waterbodies are identified and there is a bias towards waterbodies that are closer to human activity being identified. Lake charr (Salvelinus namaycush) are a highly sought after fish species for both recreational and commercial purposes. The Great Lakes drainage basin within Algoma contains a significant portion of the lake charr's range which extends across the northern portion of North America from the New England states up to Alaska. Of the 2,792 waterbodies analyzed in this article 504 of them are identified as containing lake charr. That's 18.1% of the lakes. Must have natural reproduction (may be supplemented by stoking). Should have large areas of water under the 18 metre contour (lake charr summer habitat). Should have excellent water quality throughout the water column all year. May have some natural reproduction or may be entirely maintained by planting. May have less water volume available for summer lake charr habitat. May have poorer water quality at some times of the year (i.e., lower PH, some oxygen depletion in late summer etc.). These lakes have ceased to be managed primarily as lake charr waterbodies although some lake charr may still be present. A and B categories are further divided into A1, A2 and B1, B2 based on land tenure. The A2 and B2 groups are less than 100 percent Crown land (land owned by the government and not under private ownership). Lake charr are an indicator species in that they have very high requirements of their habitat in order to survive. This is why water quality is emphasized in the guidelines above. Of the 504 identified lake charr waterbodies analyzed in this article 378 of them include a maximum depth figure. Below are some lake charr waterbody related statistics pulled from the data. For comparison, the average maximum depth of all of the waterbodies analyzed in the data is 19.9 metres / 65.4 feet. When looking over these statistics, it isn't surprising to see that C class lake charr waterbodies tend to be the shallowest as the fish species typically requires a waterbody with a relatively significant depth. A pie chart showcasing the distribution of lake charr waterbodies by class. Stream: A continuous or intermittent flow of water that typically utilizes a predictable path. Waterbody: A relatively static collection of water that is typically held inside of a land depression or is created by blocking a stream (i.e., a dam). OMNR (Ontario Ministry of Natural Resources): The governmental body in the Canadian province of Ontario that oversees things pertaining to land usage and natural resources. Lake Charr (Salvelinus namaycush): A naturally occurring freshwater salmonid species that is native to the Algoma area. Brook Charr (Salvelinus fontinalis): A naturally occurring freshwater salmonid species that is native to the Algoma area. Splake (Salvelinus namaycush X Salvelinus fontinalis): An artificial cross between brook charr and lake charr that is stocked in lakes for sport fishing. They are typically sterile although some populations can be naturally occurring. Rainbow Trout (Oncorhynchus mykiss): A salmonid species that was artificially introduced to Algoma and the surrounding area. Brown Trout (Salmo trutta): A salmonid species that was artificially introduced to Algoma and the surrounding area. 1. Ontario Ministry of Natural Resources. (1983). Ministry of Natural Resources Sault Ste. Marie District Land Use Guidelines. Toronto Ontario: Queen's Printer for Ontario. 2. Ontario Ministry of Natural Resources. (1982). Ministry of Natural Resources Northeastern Ontario Strategic Land Use Plan. Toronto Ontario: Queen's Printer for Ontario. 3. The Canada Centre for Mapping, Department of Energy, Mines, and Resources. National Topographic System. Toronto Ontario: Queen's Printer for Ontario. Paper maps and website used. 4. Ontario Ministry of Natural Resources. Fish ON-Line. Website. 5. MITIG Forest Services Ltd. (1999). The Great Outdoors Map. 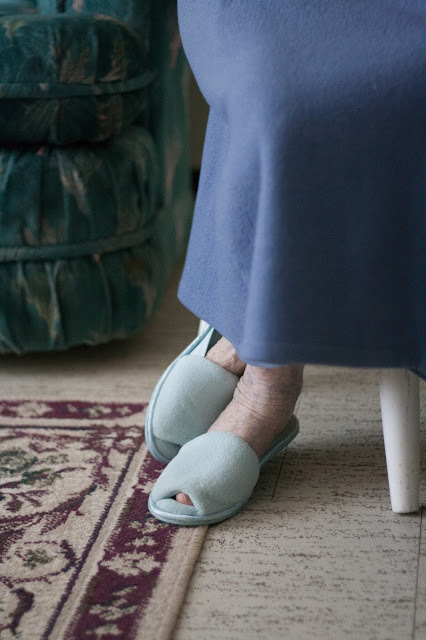 I put together this article in honour of my grandmother who passed away just a little over a year ago. She adopted and raised my mother and was an important part of my life as I grew up. 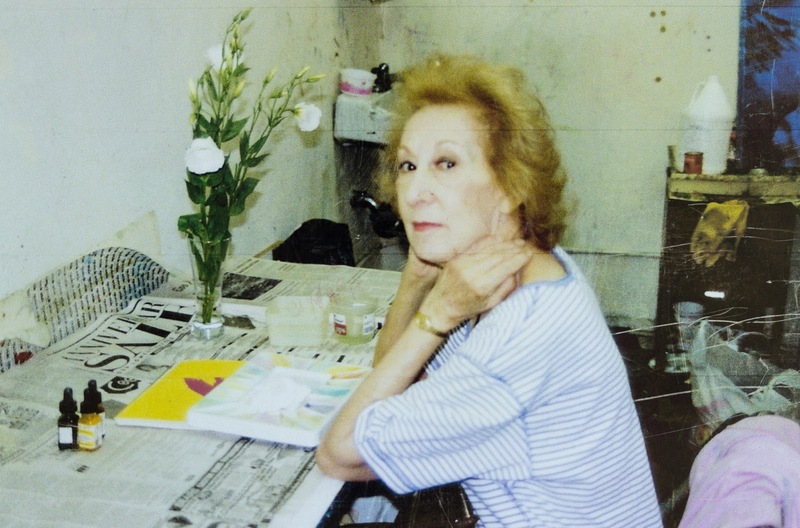 She was very nice, generous, and helped me in many ways in my life. 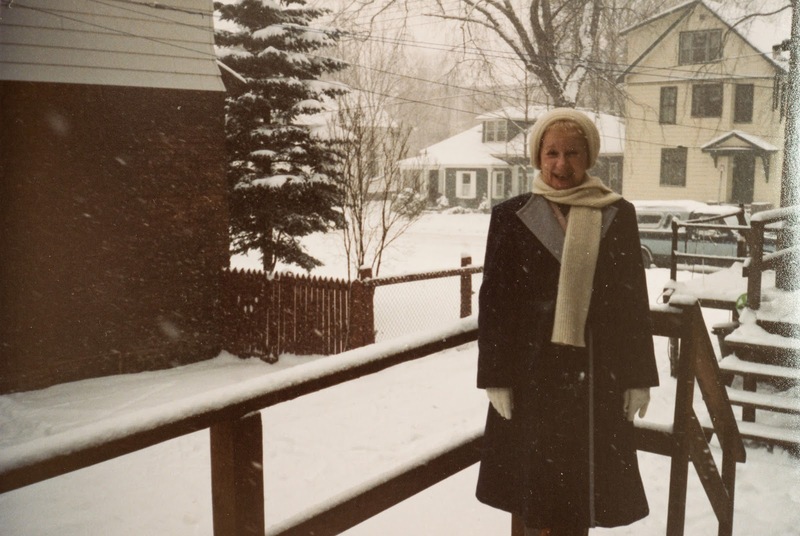 I put together this article as a way to remember my grandmother and to share her life's story. Photo by Mme. Yvonne, A.R.P.S., 98, Charming Cross Road, W.C.2. Tem. Bar 4874. 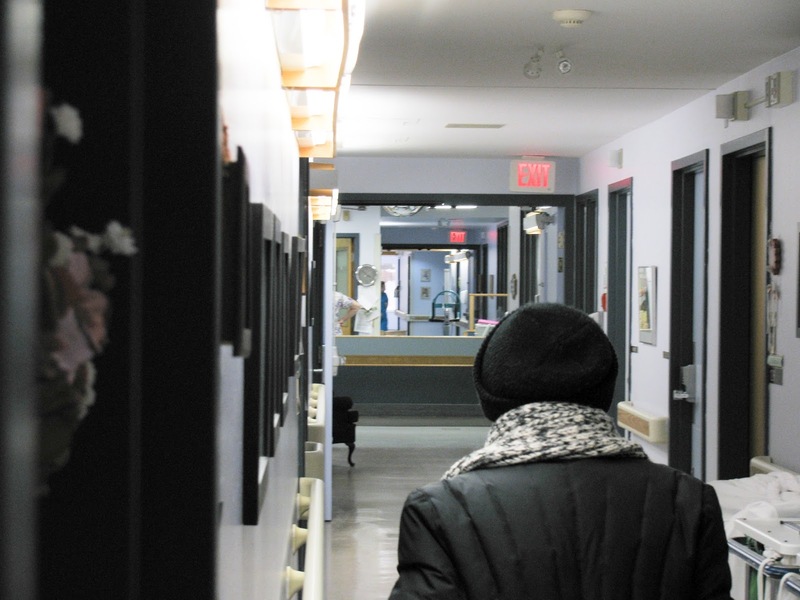 The following is from Faces of the Sault a section published in the newspaper, Sault This Week. It was titled, "Kitty McCandless, She toured Europe and taught Sault children to dance." 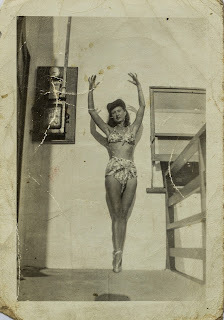 "There was a time when Kitty McCandless was Kitty May, the dancer. A time when she performed at London's largest venues, including the Palladium and the Phoenix. During the thirties and the Second World War, before television filled our days, audiences were hungry for live entertainment, and Kitty's troupe toured Europe, providing a variety of shows: musical comedy, variety, cabaret, pantomime. They did it all. It all began in dance class. Kitty came from a theatrical family and dancing came naturally to Kitty and her sisters. Marie became a ballroom dancer, but May, Hilda, and Kitty tried everything. 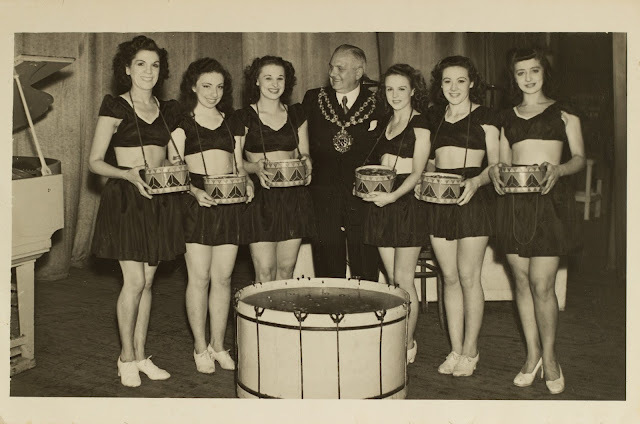 Sister Trude was a singer, Ethel was a gymnast, and brother Jack played the drums. Kitty turned professional at 12 years of age in association with Terry's Juveniles, performing in the theatres of London, including the Palladium. "She got agents to book us to all kinds of places. We were all 12 years old." "We had a tutor in between shows. Say we had a show in the afternoon, then in the evening we would have a tutor and we would learn everything then. I had to be out of the theatre by 10 p.m. because I was so young. If you weren't, then, what we called the school board man, would come around and find out and there would be big trouble. 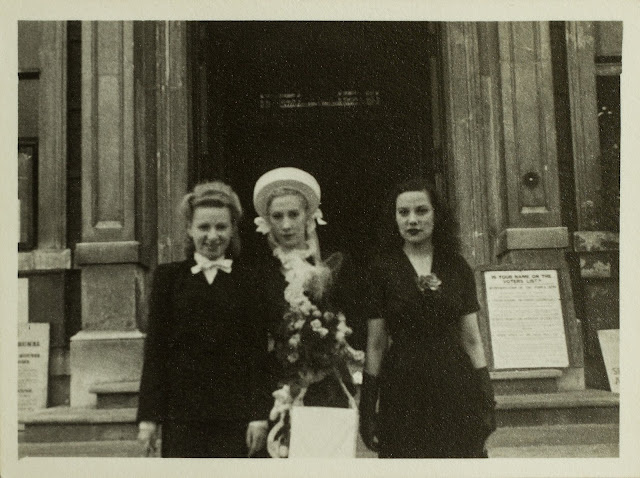 So I had to have somebody pick me up, like my mother or my older sister to take me home." "When I got older, I left and we had a newspaper called The Stage. We'd look in 'For the Performer' and there'd be auditions and I'd go up for these auditions. I'd have to walk across the stage, turn around, then I'd have to perform. There'd be a pianist there. He'd play whatever number you wanted and you would go into role. And if they liked you, you went to one side. 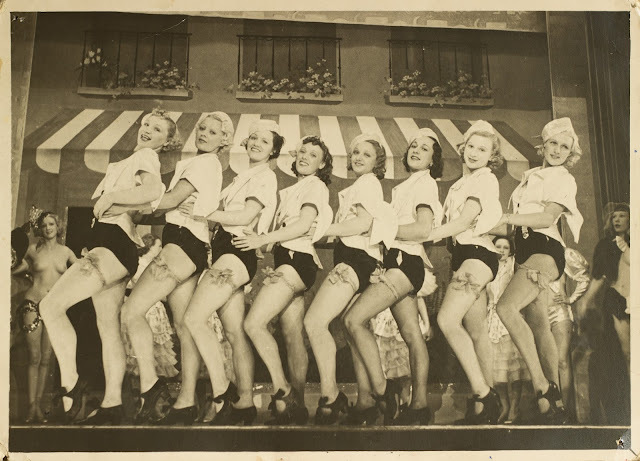 There would be hundreds and hundreds of girls that would go out for auditions and I was very lucky. I got picked for every audition I went to. The shows would run about six months if they were good, about a month if it were no good." 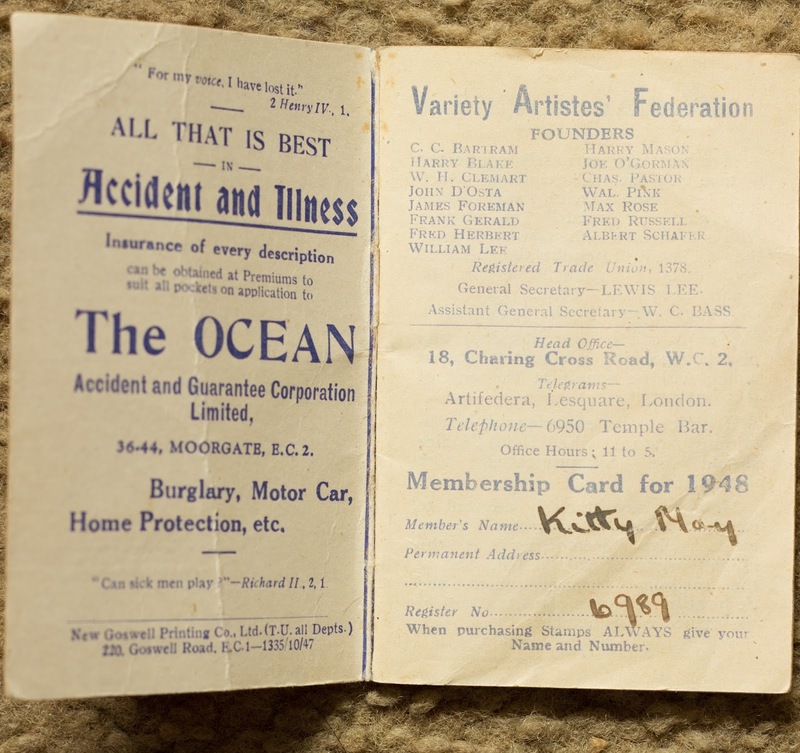 Kitty recalled performing at a seaside resort in Blackpool with her sister, for six months. "That's all I did, all my professional life. I was in musical comedy, variety, cabaret, vaudeville, and pantomime. I especially loved musical comedy. The theatres were packed. I remember my mother went to see the shows, when she was alive. 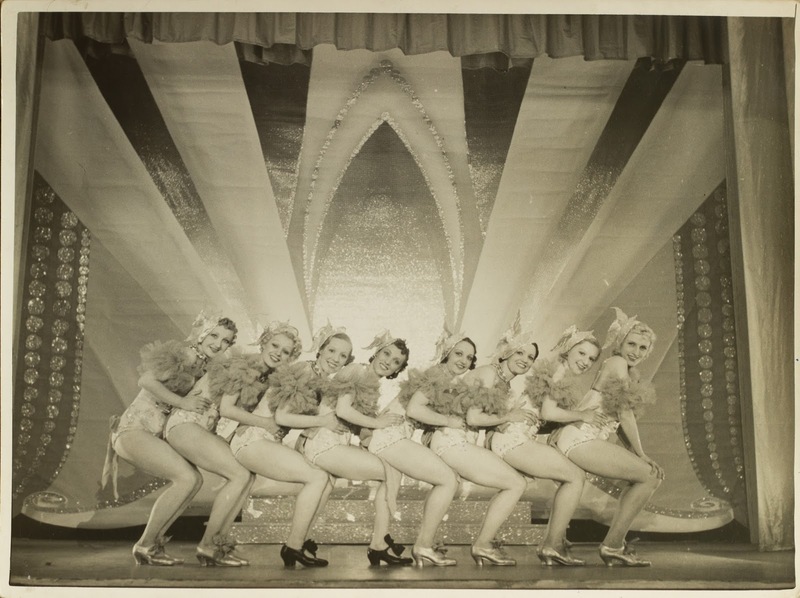 She used to sit in the front because she had three daughters performing in the same show." 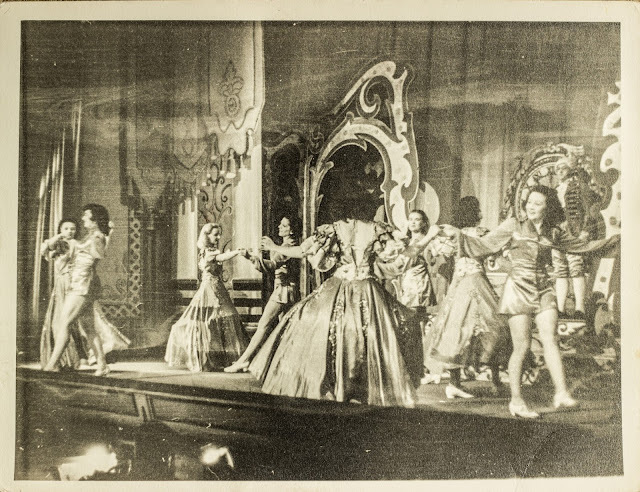 "We all had a wonderful time, but it was a very hard life, being in the theatre. I don't care what anybody says. You're touring the world, going from one city to another, and you're packing and unpacking your bags. It was really hard. 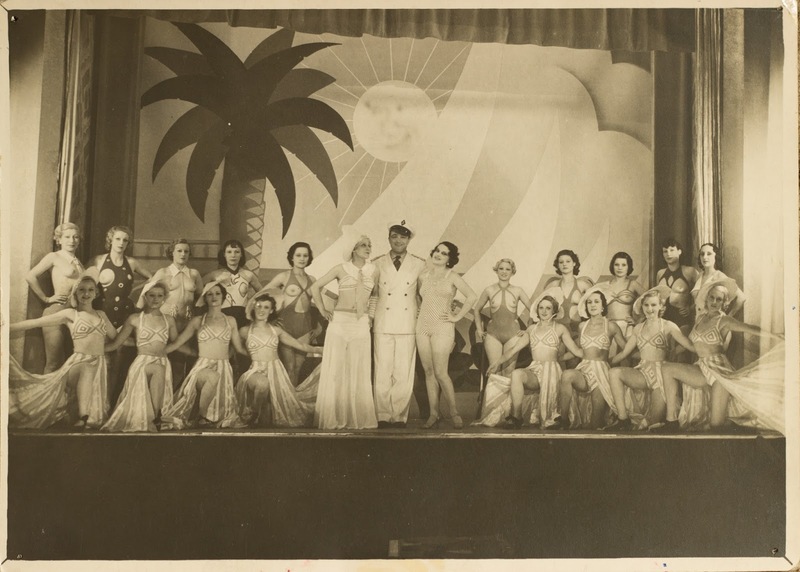 At the Phoenix Theatre we performed non-stop, five shows a day. That was hard. We were always performing, and we had to change our routines every two weeks." 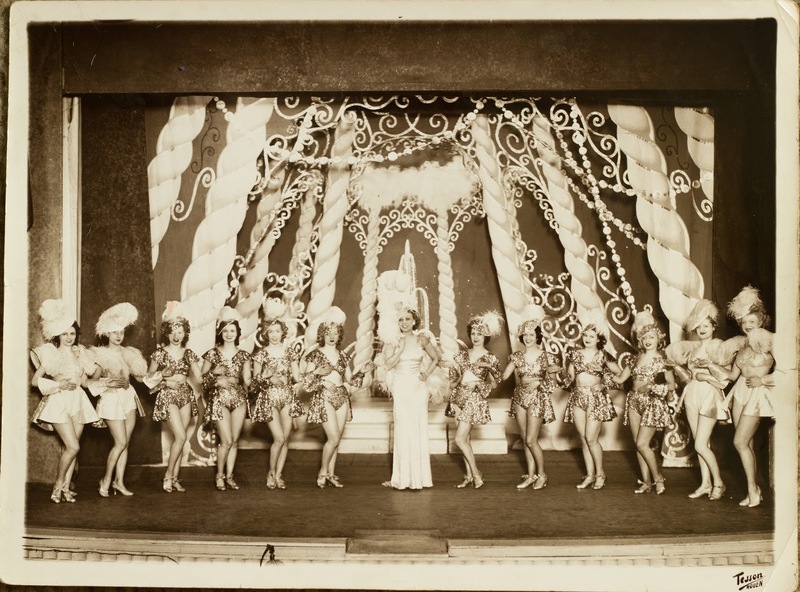 Then one day the beautiful Kitty May settled in Paris, with a regular gig at the world famous Casino de Paris. 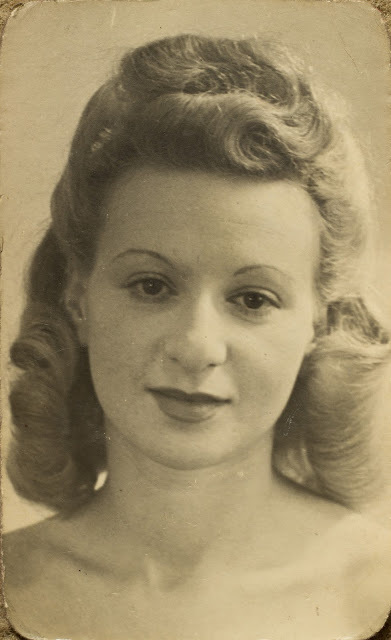 She loved Paris, spoke French, made friends. She would have settled down for good, but war broke out and she returned home to London. "I lived in France for three-and-a-half years. 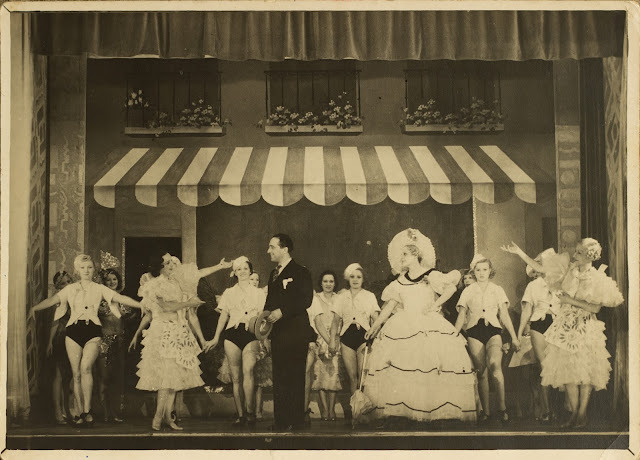 I danced there at one of the bigger theatres they had, called Casino de Paris. It was a wonderful theatre. I really enjoyed it there. I loved it. I had a boyfriend there and I really would have loved to live there altogether and got married there, but war broke out. I came back to England." Even during the war, Kitty's troupe toured, being charged with the obligation to lift morale among the war-weary British. Even when the sirens wailed, Kitty and her colleagues were expected to carry on, in the face of imminent danger. "We never unpacked, because every city we went to, a siren would wail. But they said to keep going and entertain, to keep morale up, whether the bombs were falling or not. They used to drop incendiary bombs that would start fires, which we would try to put out." 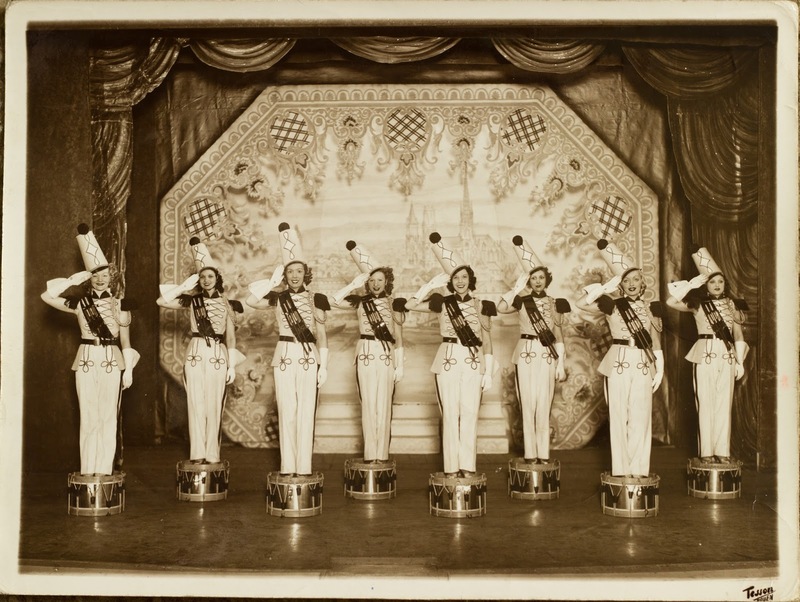 "We entertained the troops during the war. We went over to France, to Belgium. It got really sad, seeing all the airmen going up. We went to all the different tents to entertain. We were eight girls. There were other companies as well, besides us. 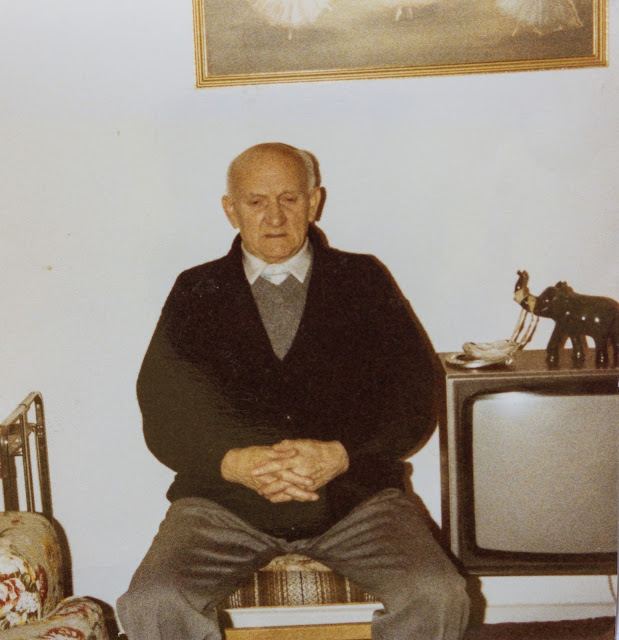 When we came back across the water, we saw the ships that had been blown up." 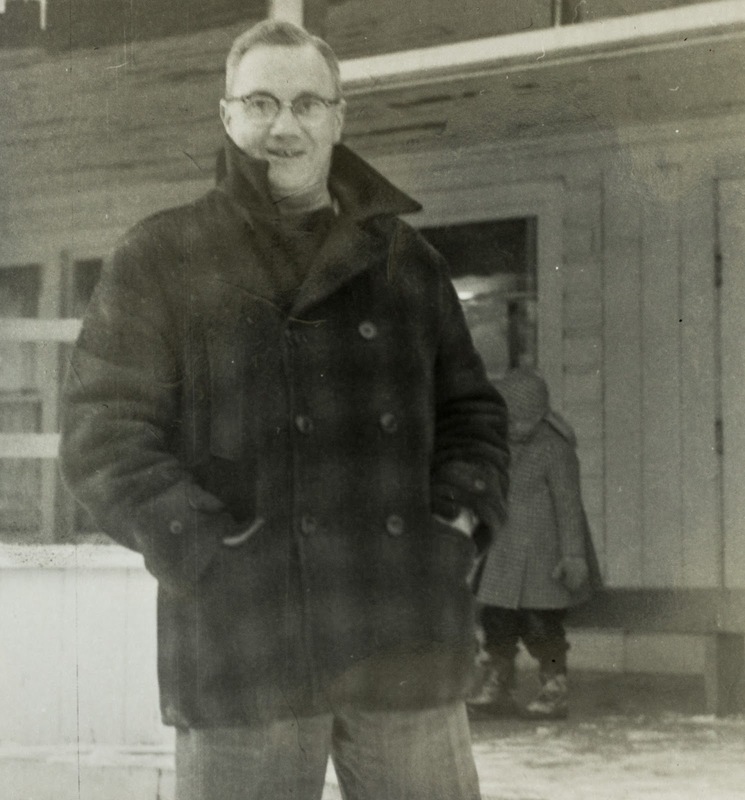 After the war, Kitty emigrated with Harold Myers, moved to Sault Ste. Marie, and got married. 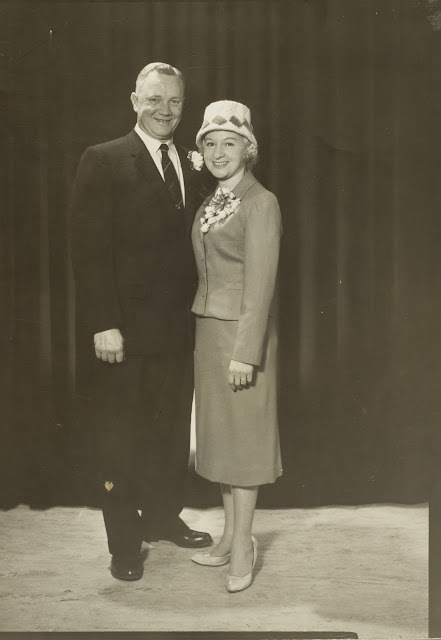 About 12 years later, after Harold had died of cancer, Kitty married Joe McCandless, and raised four children: Julie, Bill, Debbie, and Joe Jr.
Over the years, Kitty taught dancing to Sault children and put on various recitals, at the Moose Lodge, at the Legion, and at Memorial Gardens which were a big hit. 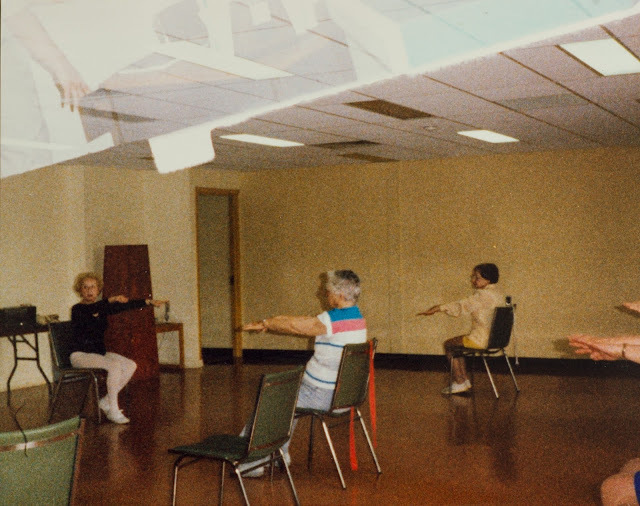 Kitty also held exercise classes for 15 years as a volunteer at the seniors Drop-In Centre on Bay Street. Today, the pace of Kitty's life has slowed somewhat, but she still leads an active life. She currently lives in an apartment with her sister Ethel and is often seen about town with her daughter Julie." Photo by an unknown photographer. Photos by an unknown photographer. This section is mostly sorted by photographer. 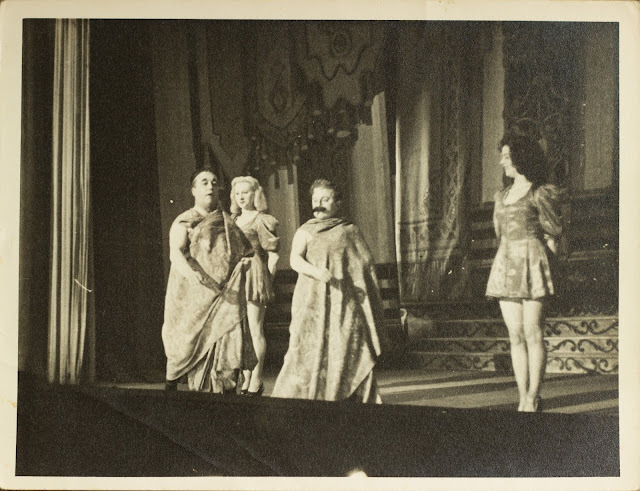 By the looks of it, these photographers tended to be specific to particular theatres and locations meaning that many of the photos taken by the same photographer could be from the same show or at least from the same venue. 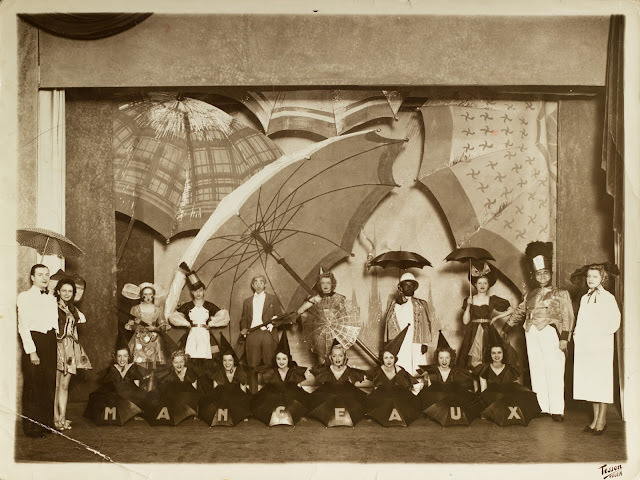 The address for the photography studio is in Paris, France, which likely indicates that these photos were taken at least in France, if not Paris. Perhaps they were taken at Casino de Paris, as Kitty performed there for three-and-a-half years. 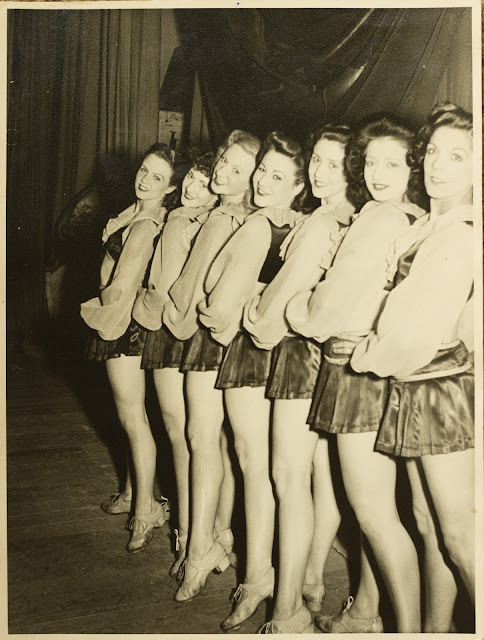 Kitty, second from the left in the back row. Photo by Studio E. Brucken, 17 Faubourg Saint-Martin, Paris, France. Kitty, third from the left in the front row. Photo by Studio E. Brucken, 17 Faubourg Saint-Martin, Paris, France. Kitty, first row, furthest to the right and completely in view. Photo by Studio E. Brucken, 17 Faubourg Saint-Martin, Paris, France. 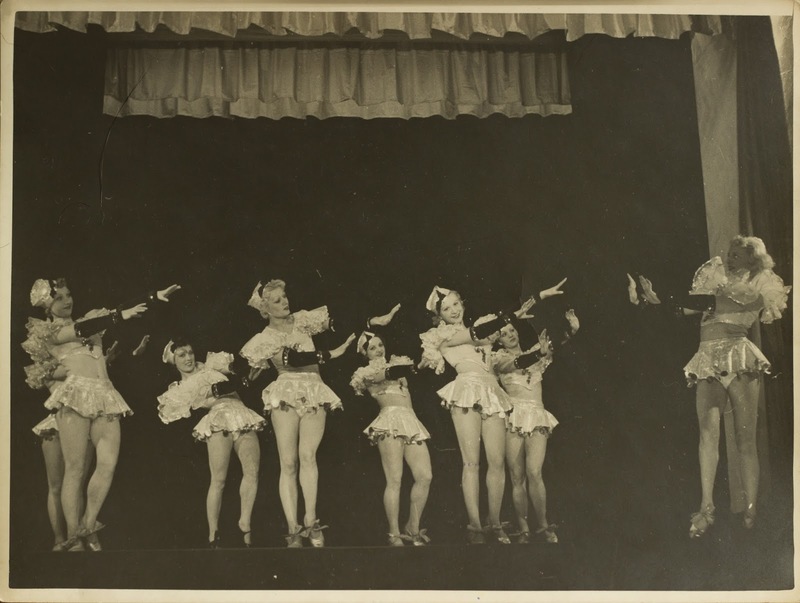 Kitty, second from the right. Photo by Studio E. Brucken, 17 Faubourg Saint-Martin, Paris, France. Kitty, being lifted furthest to the right. Photo by Studio E. Brucken, 17 Faubourg Saint-Martin, Paris, France. 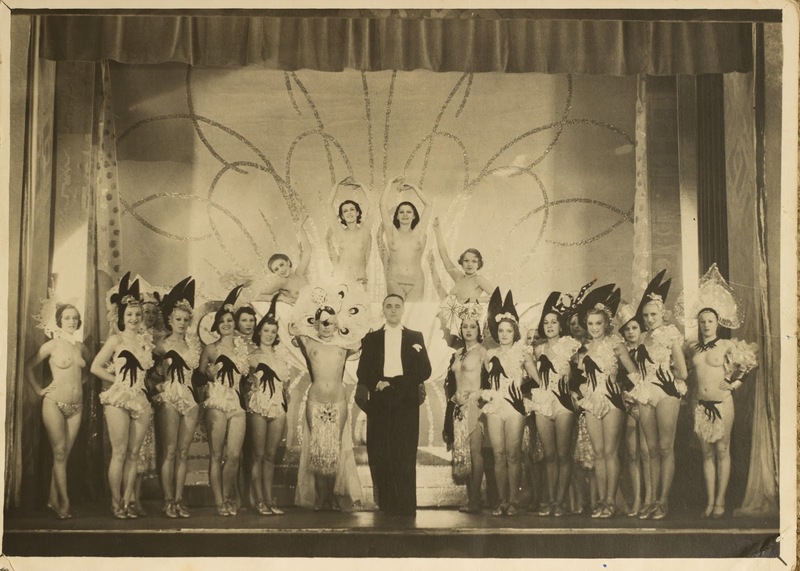 Kitty, second row from the front, second from the right and completely in view. Photo by Studio E. Brucken, 17 Faubourg Saint-Martin, Paris, France. 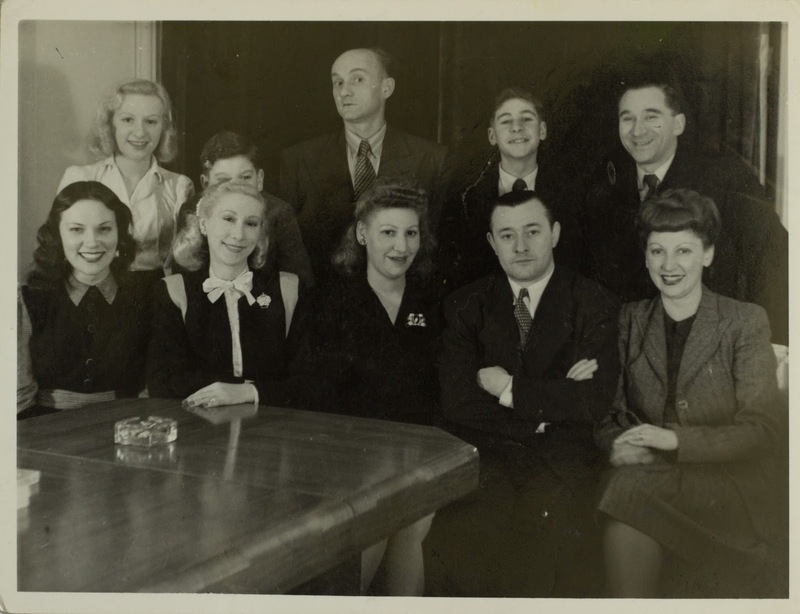 Kitty, front row, second from the right. Photo by Studio E. Brucken, 17 Faubourg Saint-Martin, Paris, France. 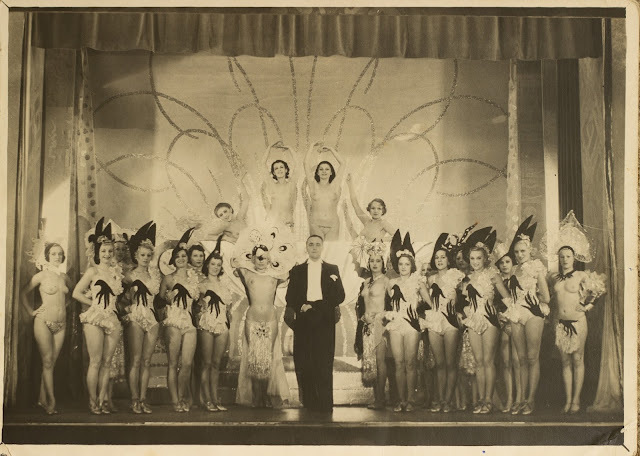 Kitty, front row, third from the right. Photo by Studio E. Brucken, 17 Faubourg Saint-Martin, Paris, France. 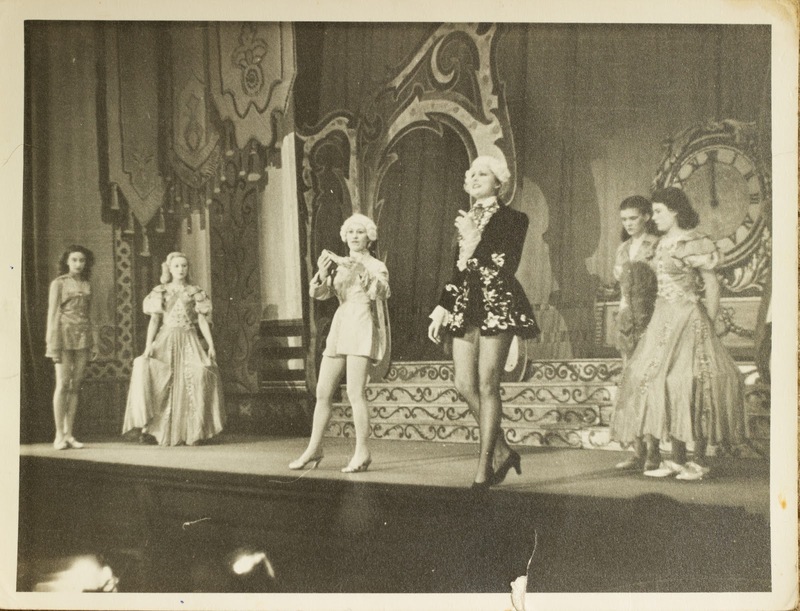 Although I haven't positively identified where these were taken, Rouen is a city on the north coast of France which is a place that Kitty likely could have performed. Kitty, third from the left. Photo by Tesson Rouen. Kitty, fourth from the left. Photo by Tesson Rouen. 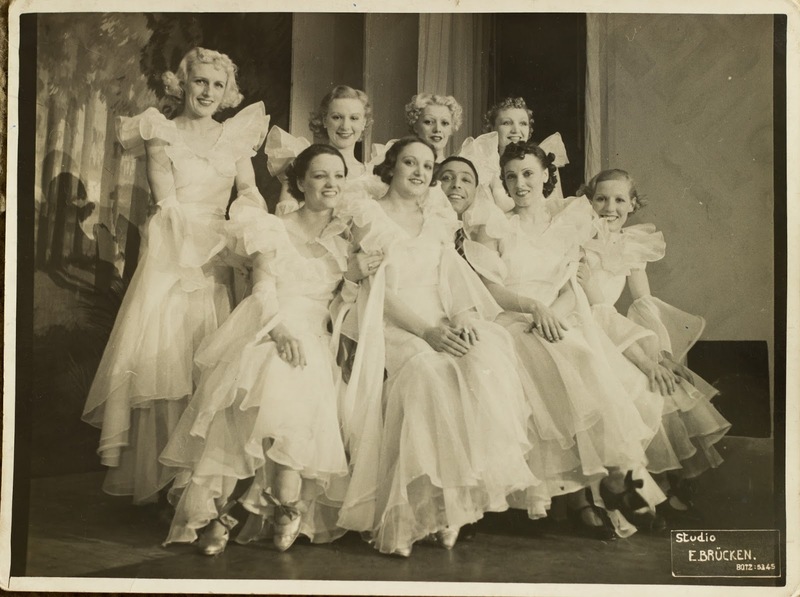 Kitty, first row sitting, second from the right. Photo by Tesson Rouen. Kitty, first on the left. Photo by Tesson Rouen. 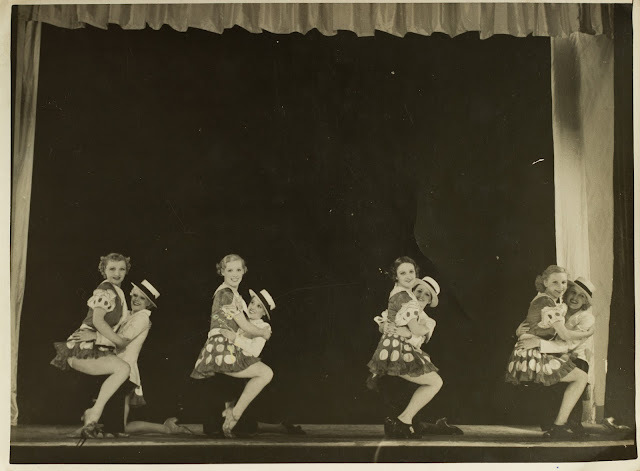 Kitty, second from the left. Photo by Tesson Rouen. 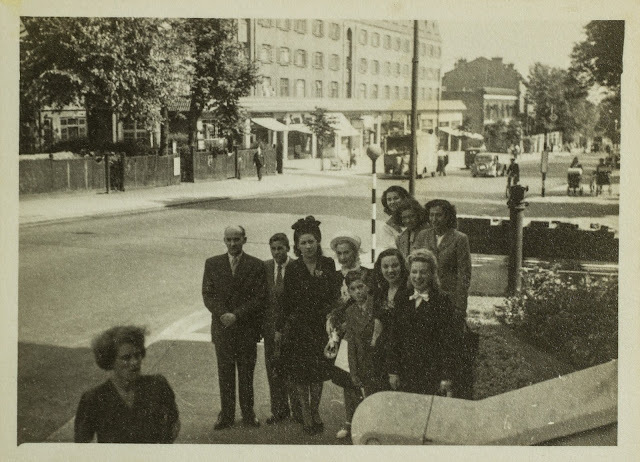 The location of the photographer is in the neighbourhood of Harringay which is located in London. 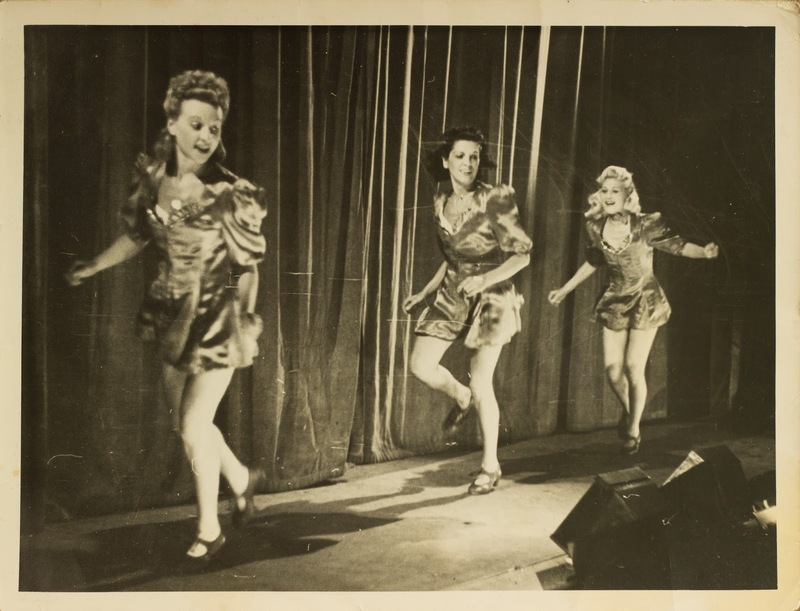 So it is likely that these were also taken in London, perhaps at the London Palladium or the Phoenix. 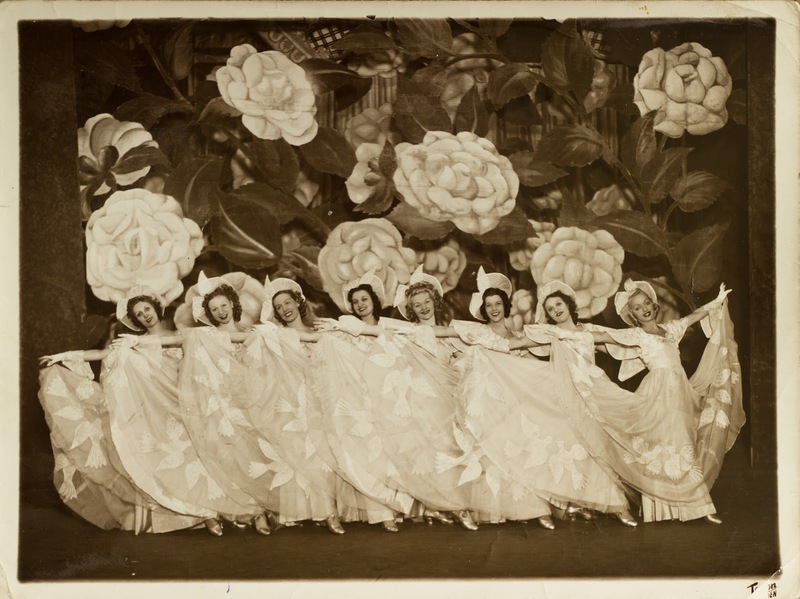 Kitty, second from the left. Written on reverse, "185/231 The same scene, wich the principal day." Photo by A. Todd, 3, Burgoyne Road, Harringay, N. 4. Kitty, third from the left. Written on reverse, "173/231 "'Cinderella Ballroom Scene. Scot is dancing with me." 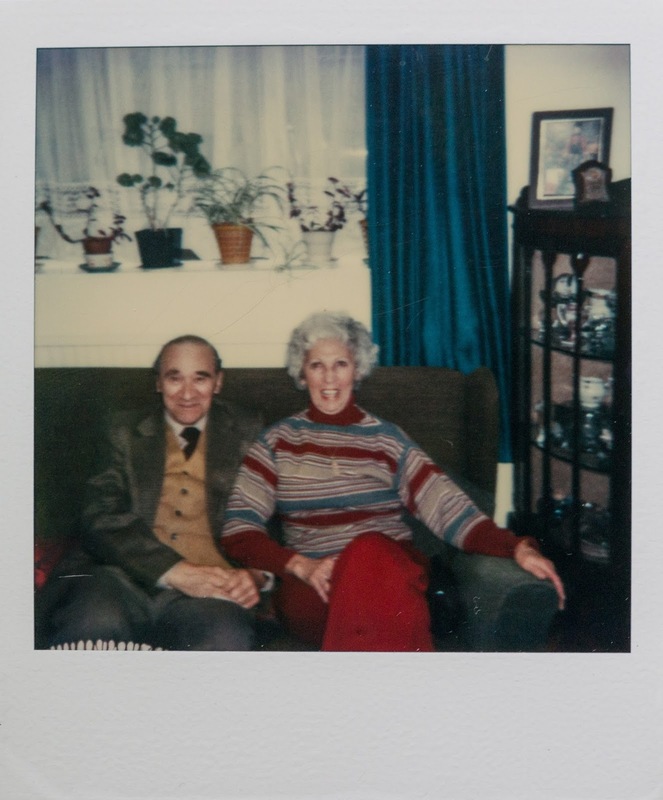 Photo by A. Todd, 3, Burgoyne Road, Harringay, N. 4. Kitty, furthest to the right. Written on reverse, "185/231 Scot and I again." 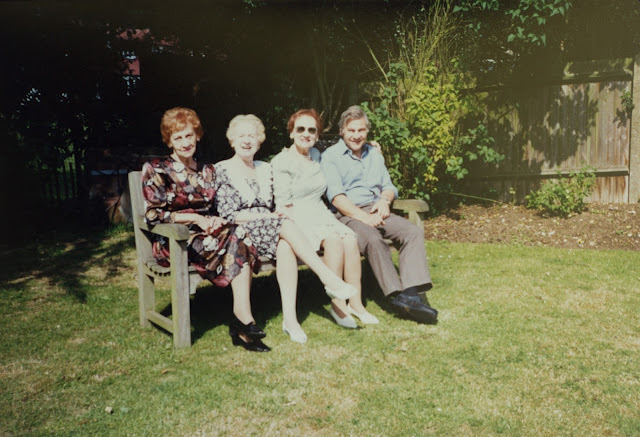 Photo by A. Todd, 3, Burgoyne Road, Harringay, N. 4. Kitty, furthest to the left. Her friend Scottie might be in the middle. 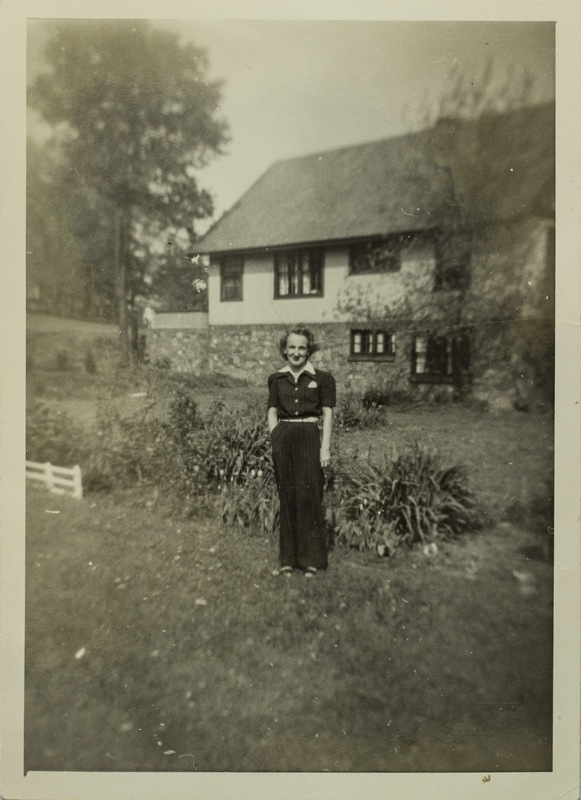 Written on reverse, "20/64" Photo by A. Todd, 3, Burgoyne Road, Harringay, N. 4. 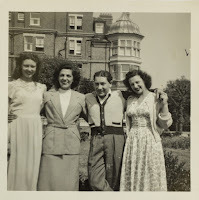 Kitty, second from the left. Her friend Scottie might be furthest to the right. 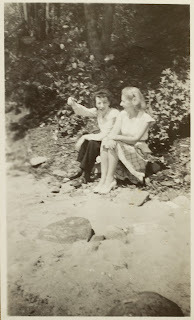 Written on reverse, "193/231 Pat and I missed the cue mom, in the photograph." 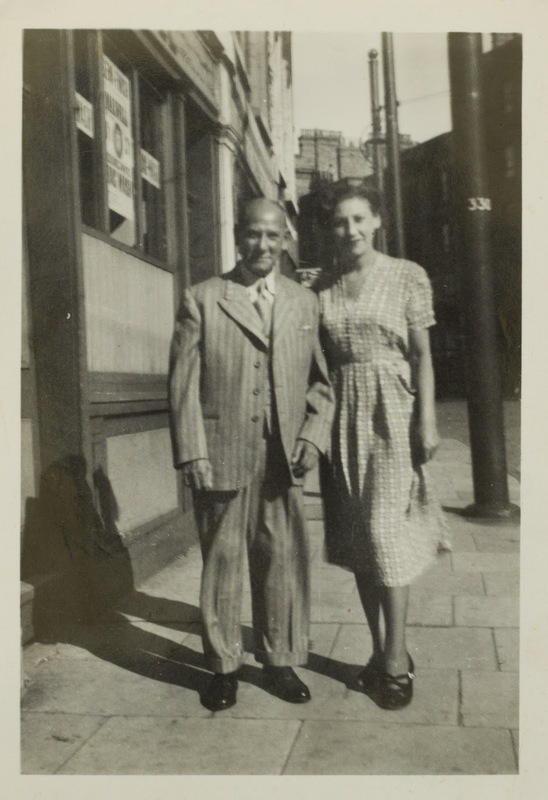 Photo by A. Todd, 3, Burgoyne Road, Harringay, N. 4. Kitty, furthest to the left. 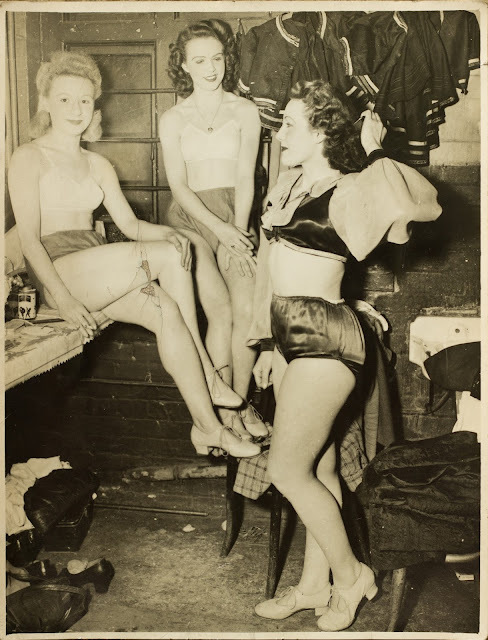 Written on reverse, "288D This was taken in the changing room. Look at the spots on my face. 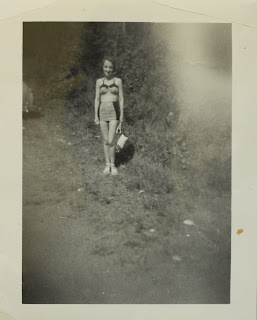 Though must have been the camera, I'll..." Photo by L. Graver-Johnson, 33 St. Helens RD. Hastings. Kitty, furthest to the left. Photo by Dudley B. Gordon. 226, Stockwell Road. Brixton, London. S,W,9. Kitty, third from the left. 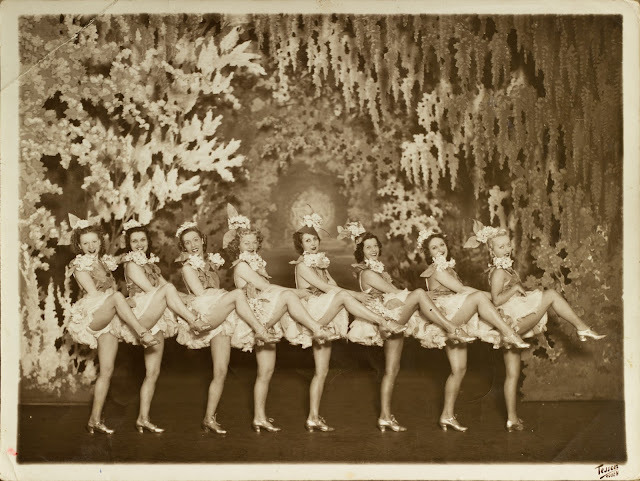 Photo by an unknown photographer..
Kitty, first row, fourth from the left. Her friend Scottie might be fifth from the right. 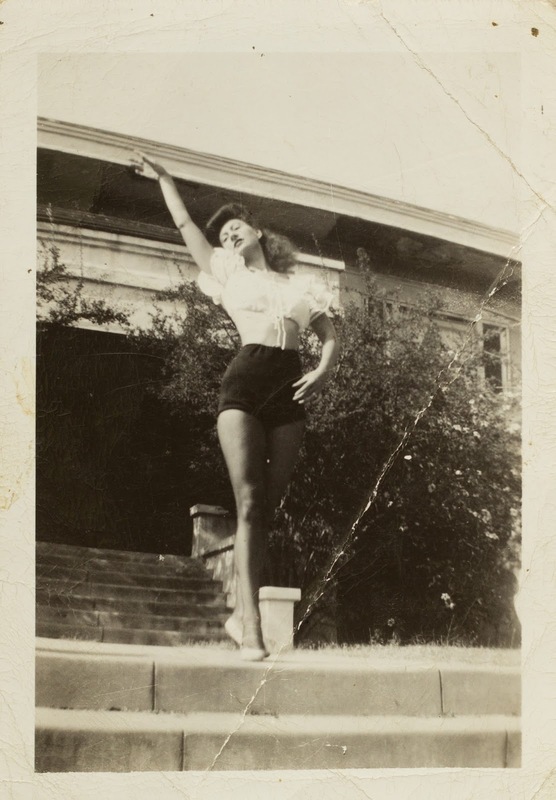 Written on reverse, "Miss May". Photo by Paramount Press Pictures. 224 Chapman Road. S.W.9. Kitty, first on the left. 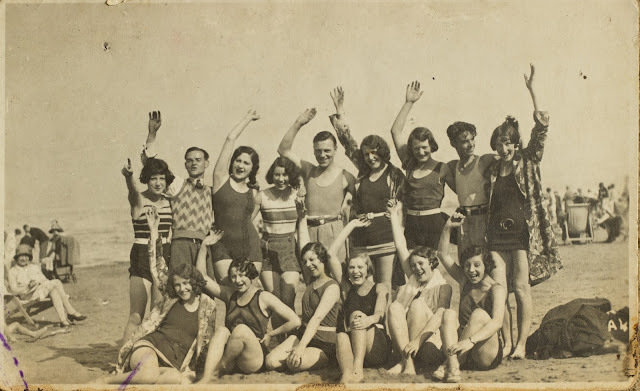 Her friend Scottie might be third from the right. Photo by Paramount Press Pictures. 224 Chapman Road. S.W.9. Kitty, middle in the first row Kneeling. 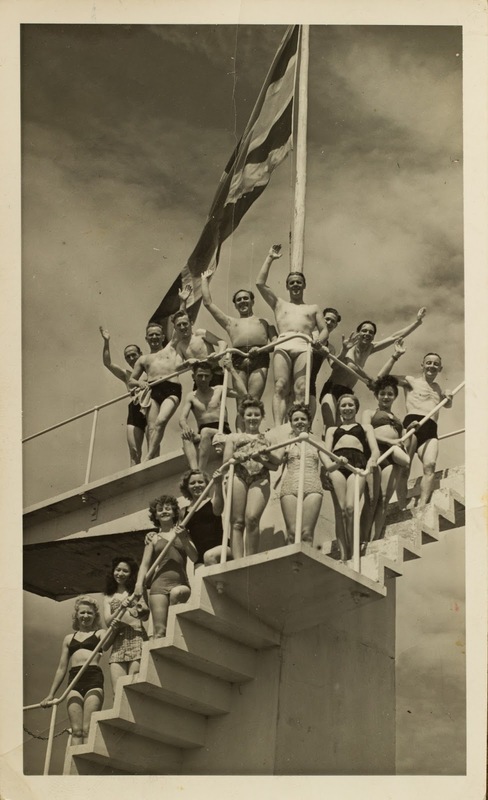 Written on reverse, "'Stairway to Stardom" Co. This is all the Company. Cyril Levis in ... top with his baby. His wife is the one with him .... ... ... face, she was just joining ... ... glasses of when she photographs snap". Photo by Pool Snaps, Bathing Pool, St. Leonards-on-Sea. Kitty, furthest to the left on the lowest stairs. Written on reverse, "This was also taken at the bathing pool. Cyril Levis is at the top in white pants; he's our boss and ..... Can you see me climbing? Scot ..... she felt a little faint going so high up." Photo by L. Graver-Johnson, 33 St. Helens RD. Hastings. Kitty, furthest to the left in the row that's standing. Photo by J. Smailes & Son, Press Photographers, Rhyl. Kitty, third from the left. Photo by J. Smailes & Son, Press Photographers, Rhyl. Kitty, likely the girl third from the right. 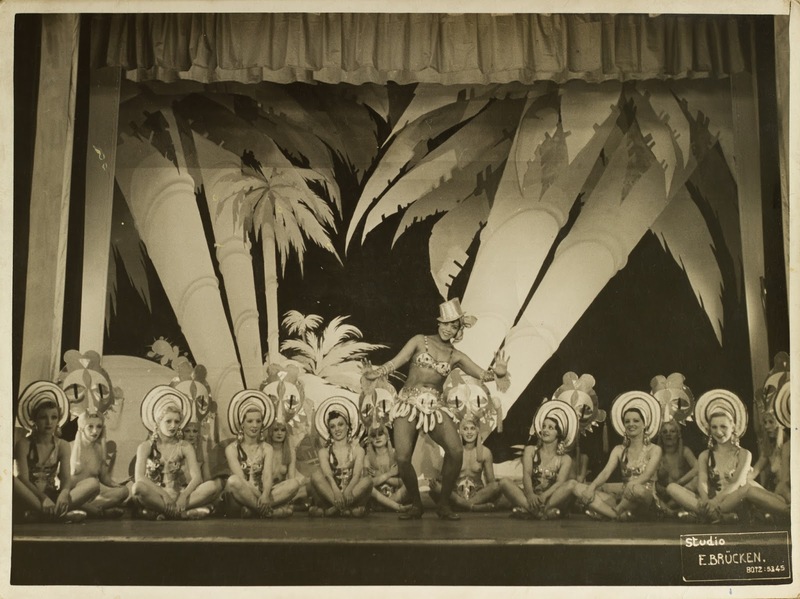 Cyril Levis is likely the man in the middle, the leader of the troupe. Photo by an unknown photographer. 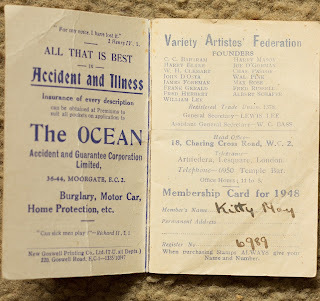 Kitty's 1948 Variety Artistes' Federation "VAF" booklet. The VAF, which incorporated in 1967 as "Equity", is the UK's trade union for professional performers and creative practitioners. Photos taken by me. This section covers her life after she moved to Canada from England in 1948 to marry Harold all the way up to when she passed away. She worked as a performer until she moved to Canada. While living in Canada, she only ever lived in one city, Sault Ste. Marie, Ontario. 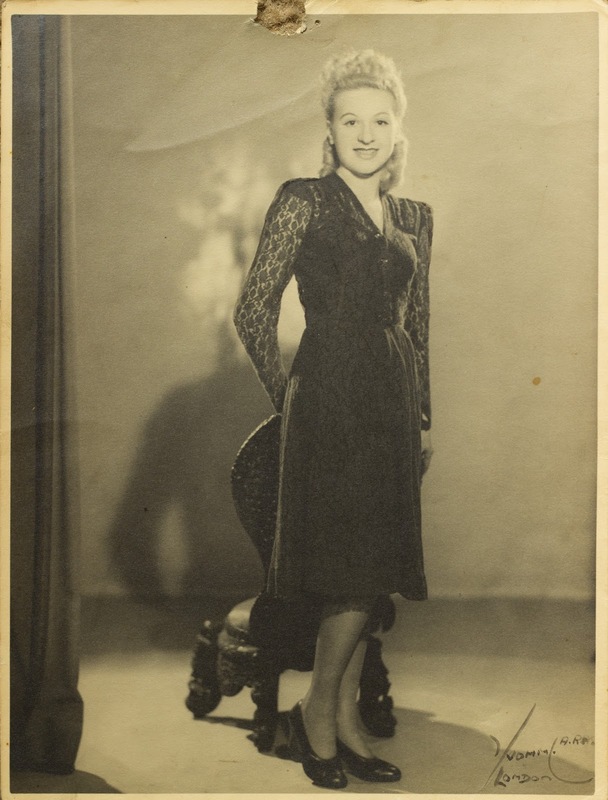 During her time in Canada, she taught children how to dance, put on recitals, and held exercise classes at the seniors Drop-In Centre. Kitty, right, and her twin sister, Ethel, left. 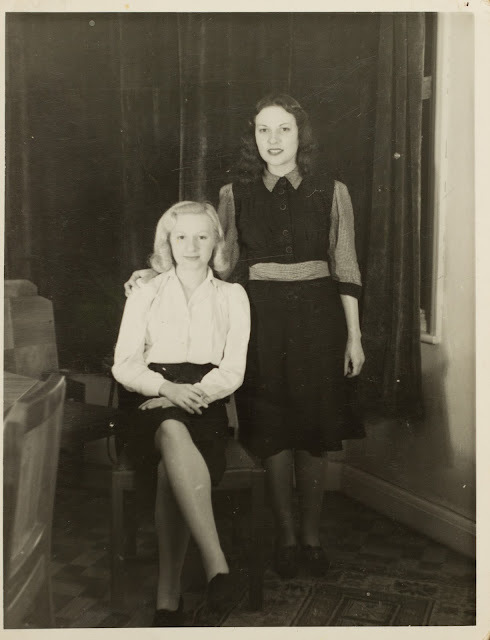 After Kitty left England to get married to Harold, Ethel followed Kitty a few years later and lived with her. Ethel, left, and Kitty, right, at Windsor Castle while visiting England in 1976. 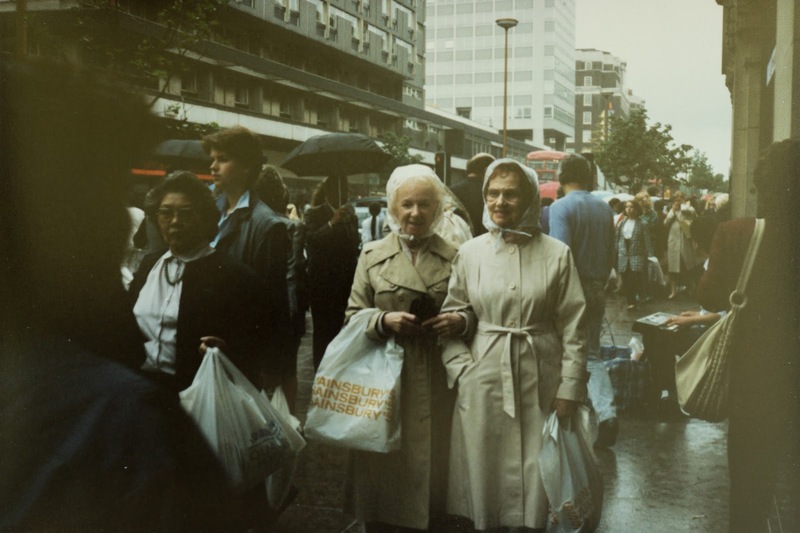 Kitty, left, and Ethel, right, both wearing bonnets, return to London, England for a visit where they meet up with their sister Marie. This was likely taken in the 1980's. Kitty, far left, as a volunteer fitness instructor at the seniors Drop-In Centre. Kitty, left and her twin sister, Ethel, right. This was taken behind her townhouse likely during the 1990's. Kitty, right, and Ethel, left, were both very active all the way up until their final days. They would commonly walk from their townhouse to the mall located downtown and back. Kitty outside of her townhouse in the snow. 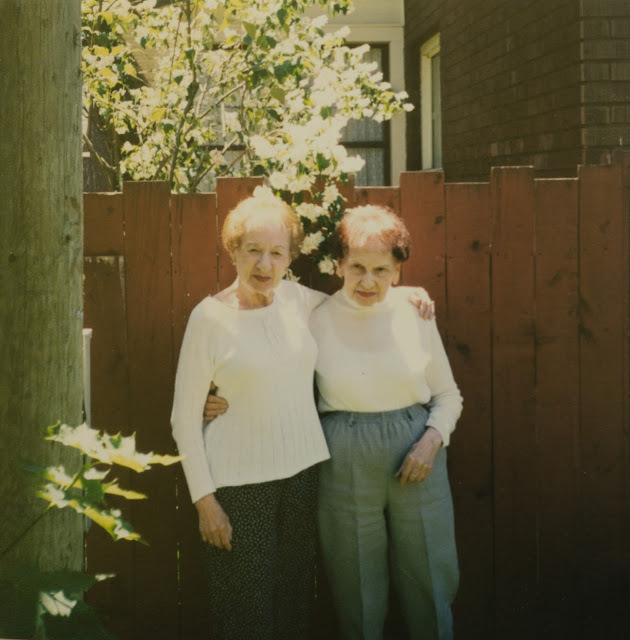 Kitty, right, and her twin sister, Ethel, left, inside of their townhouse. Kitty loved drinking tea. 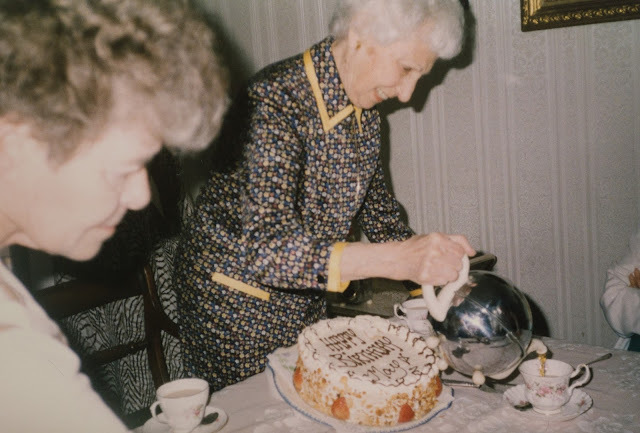 All throughout my childhood, whenever I'd go to her home or go to a restaurant with her, she'd have tea. This particular place we frequented a lot and I have many memories of her drinking tea here. This was taken 3rd of December 2008 by me. Kitty going to see her twin sister, Ethel who was in a care home. Photo taken by me on the 26th of January 2009. Kitty sitting at the kitchen table in her apartment a few days after her twin sister, Ethel, passed away. I took this photo on the 1st of May 2010 in Kitty's last apartment. Taken at the same time as the photo above. Kitty's sofa is to the left. She is sitting at her kitchen table. Rose Jacobs, Kitty's mother. Photos by "Regal Portrait Co.," 8 Aldgate High Street, E.C.3. Kitty's twin was very close to her. 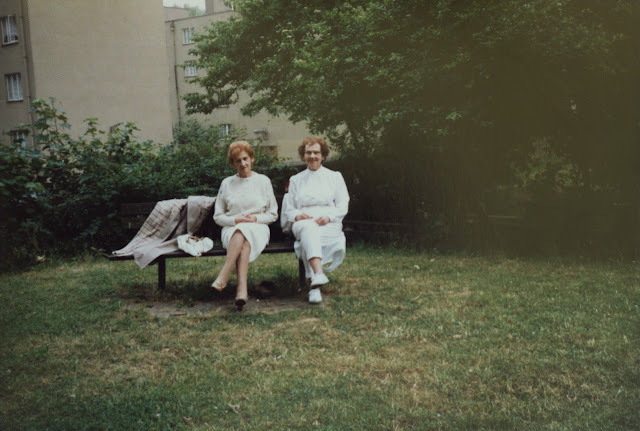 For nearly all the time that I've known my grandmother they lived together. 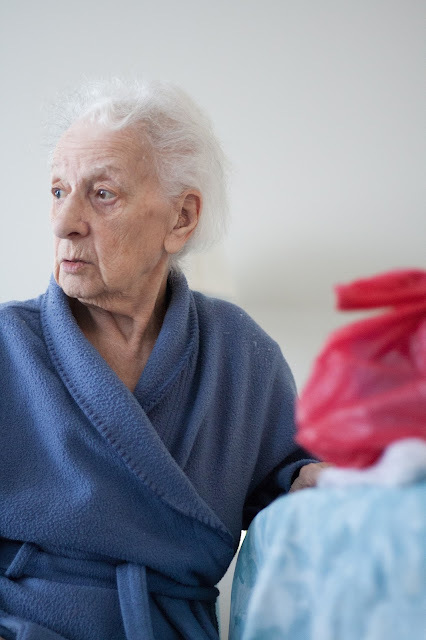 It was only when Ethel's health deteriorated and she needed to be put into a care centre that they weren't together. 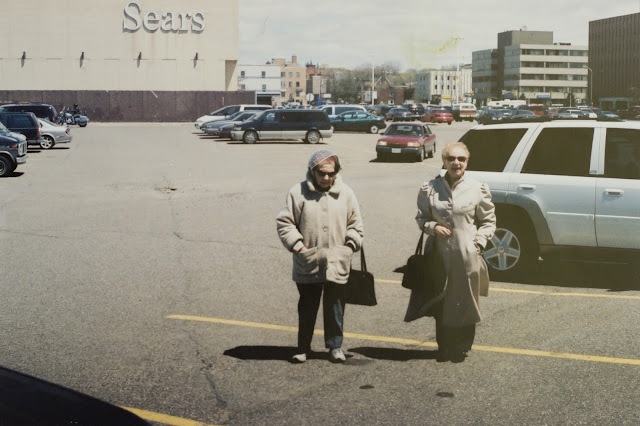 Despite this, Kitty would go with my mother to see her twin sister nearly every single day until she passed away. 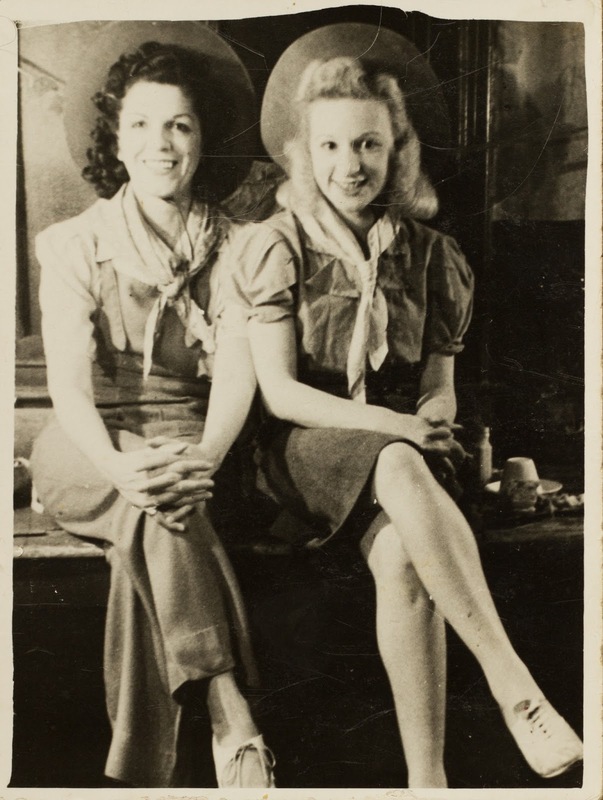 Kitty on left, her sister, Ethel Jacobs, on the right. 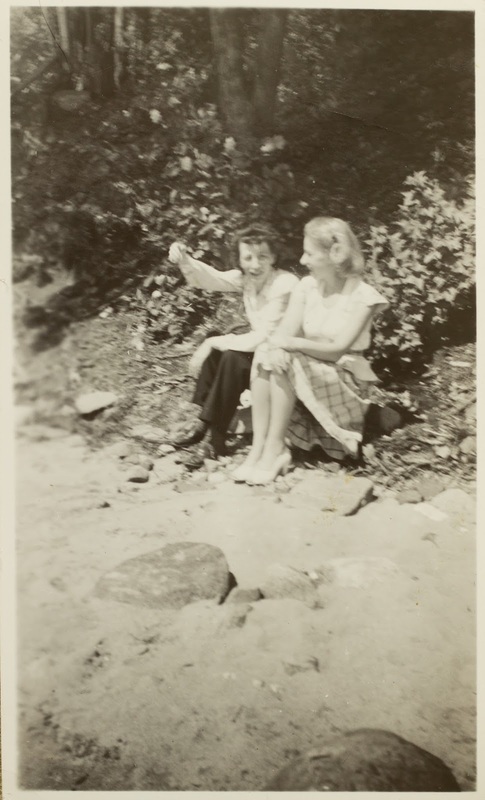 This photo was perhaps taken when Ethel and Kitty went to California to visit their sisters Hilda and Trude. Photo by an unknown photographer. 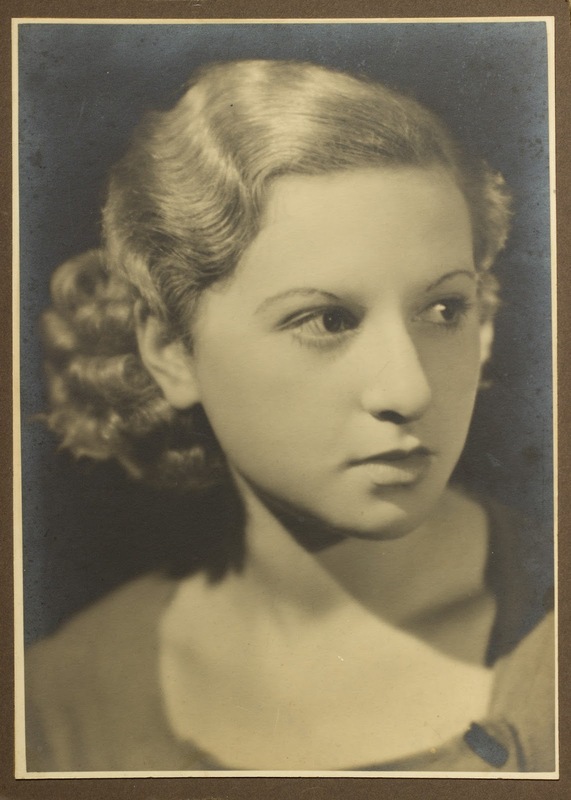 Both photos are of Kitty's twin sister, Ethel Jacobs. 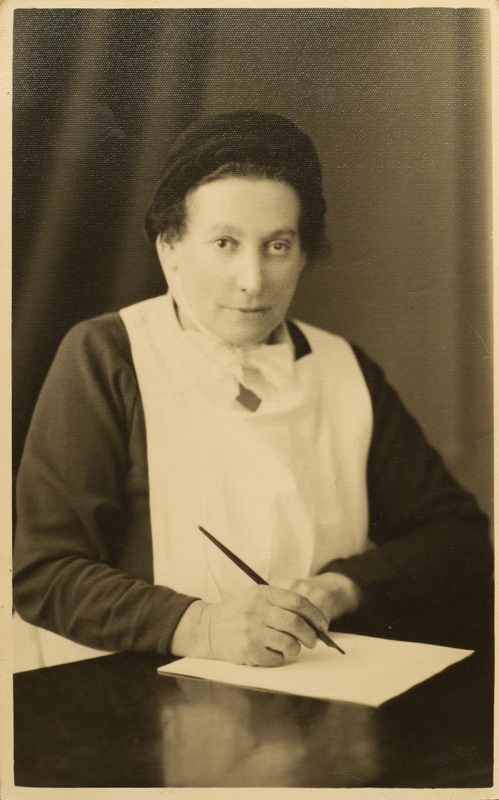 On the left photo, written on reverse, "Ethel My Beautiful Sister". On the right photo, written on reverse, "Ethel I've loved you so much". Photos by an unknown photographer. 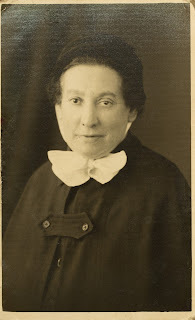 Kitty's sister, Ethel Jacobs. Photo by an unknown photographer. I'm not as familiar with the rest of Kitty's siblings as I've never met any other than her twin who she lived with. 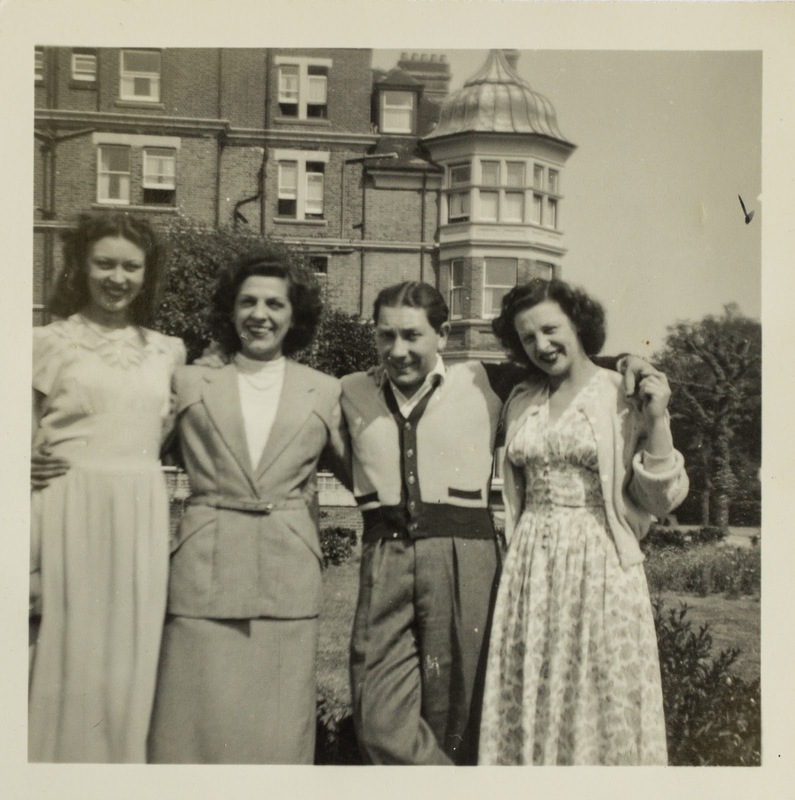 The siblings became scattered, Hilda and Trude lived in California, Kitty and Ethel in Canada, and May, Marie, and Jack stayed in England. 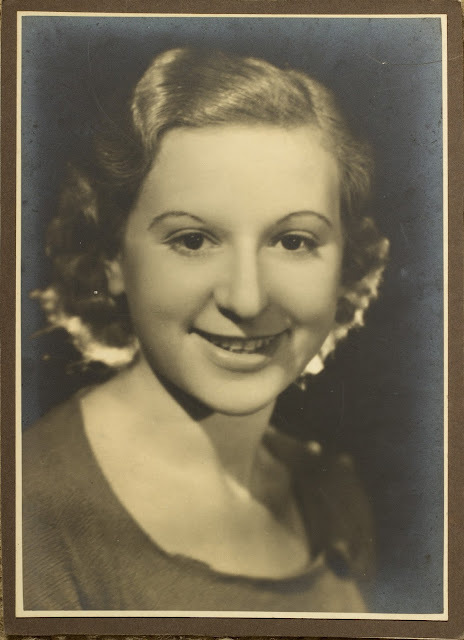 Both photos are of Hilda, one of Kitty's sisters. 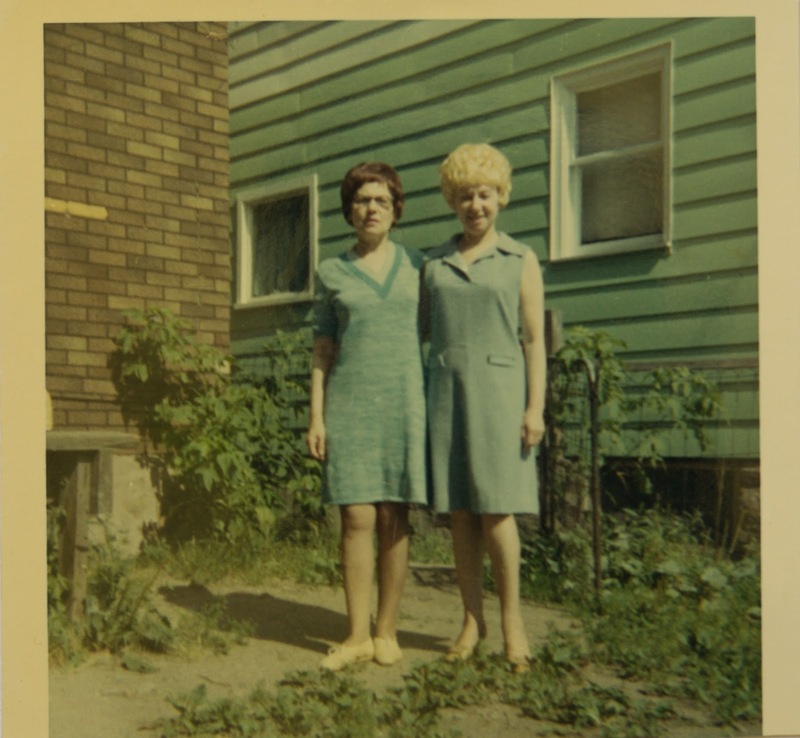 Written on the reverse of the left photo, "Lots of love, Hilda. Hollywood, California. 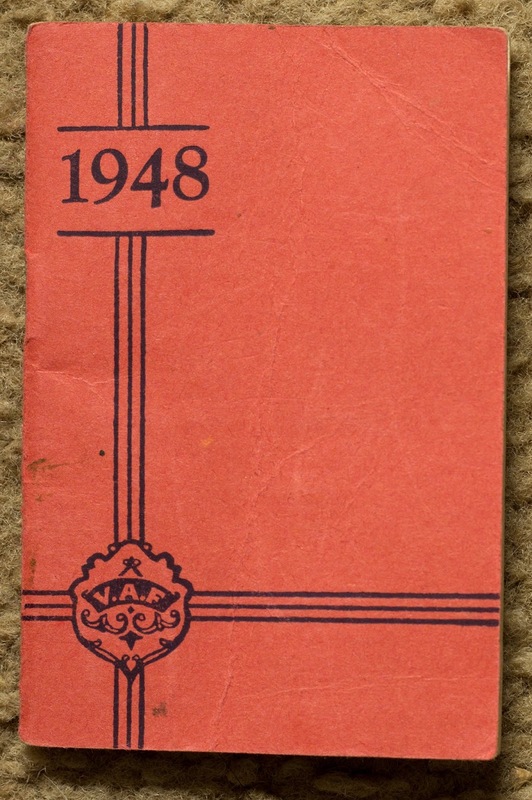 1946". 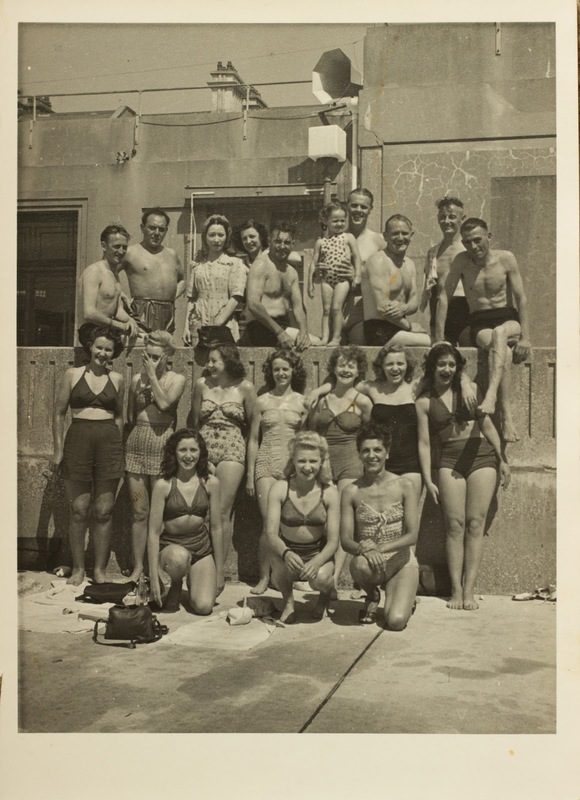 Written on the reverse of the right photo, "Hollywood Beach, California, 1945. Wind was blowing so hard, and sun in my eyes....."
Hilda, one of Kitty's sisters. 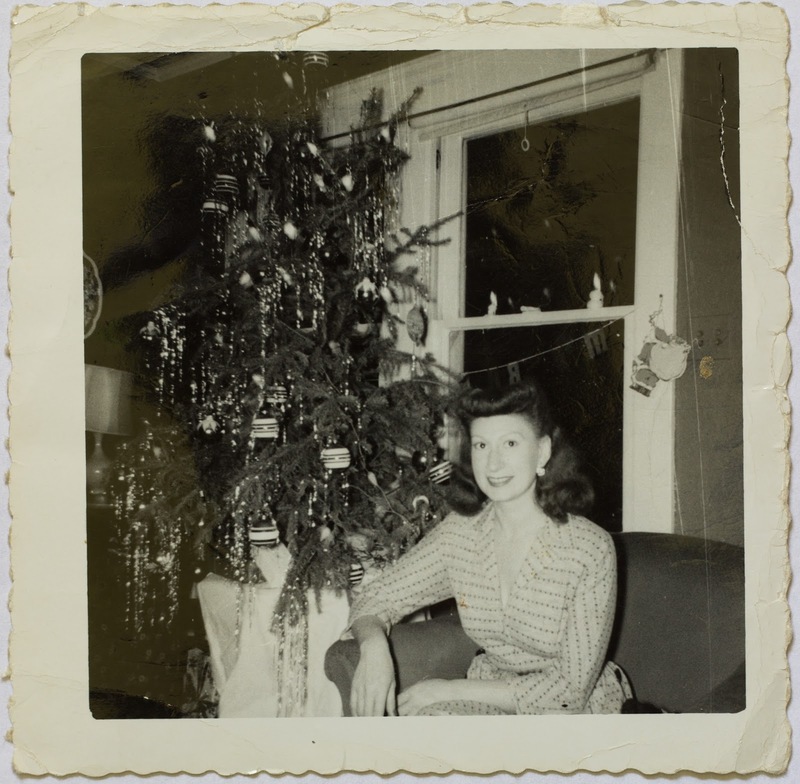 Written on reverse, "Hollywood-Xmas-1950. To Ethel, with fond love from your sister Hilda". Kitty's sister Hilda to the left, and her husband, René, to the right. I believe this was taken on her birthday. Written on reverse, "Nice? April 2nd, 1989". Kitty's brother Jack on the left and her sister Trude on the right. Jack, Kitty's brother, is in the centre. 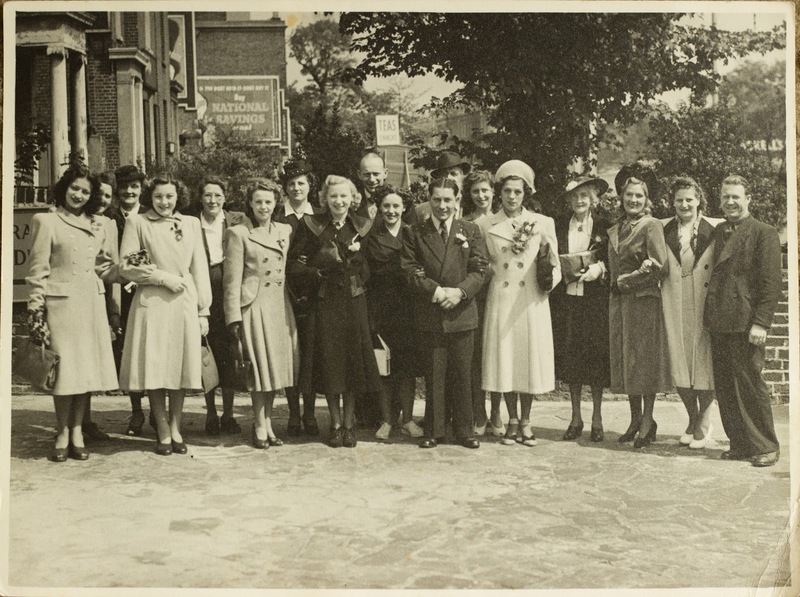 The other two are likely husbands of the other sisters, with perhaps Hilda's husband on the left, and May's on the right. 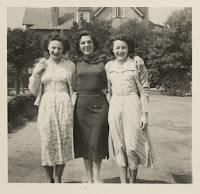 This photo was likely taken in California when Kitty and Ethel went to visit their sisters Hilda and Trude. Jack, Kitty's only brother. 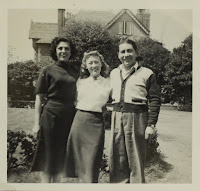 Written on reverse, "To Kitty + Ethel with my love brother Jack x x x x x". Marie, on right, one of Kitty's sisters. Written on reverse, "Dear Kitty. This was taken out-side ....'s shop. She was trying out a new camera. All my love, Marie. x x x x 1950"
Marie on right, Kitty on left. Written on reverse, "To/ Kitty with all my love, Marie. x x x x x A remembrance. P.S. Try and come out soon with Joe. 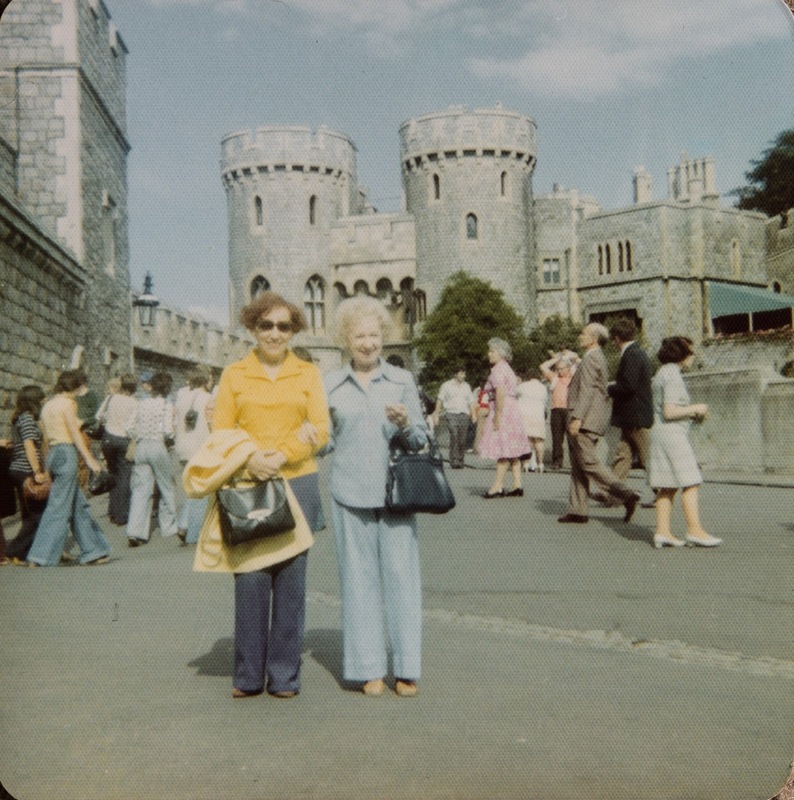 x x x x"
Marie, left, and Ethel, right, when Kitty and Ethel went to London England for a visit in the 1980's. From left to right, Marie, Kitty, Ethel, and Roy, one of Marie's sons. 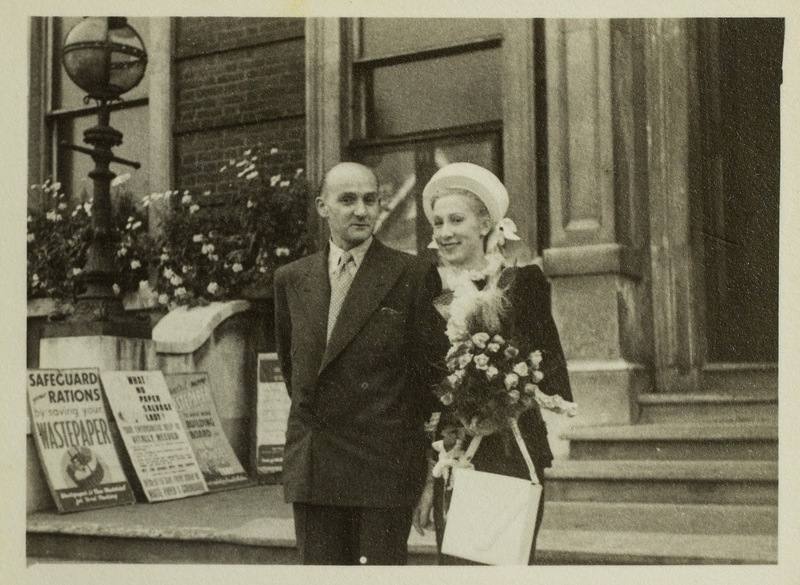 Likely May, right, and her husband, left. On the cake it says "Happy Birthday May". 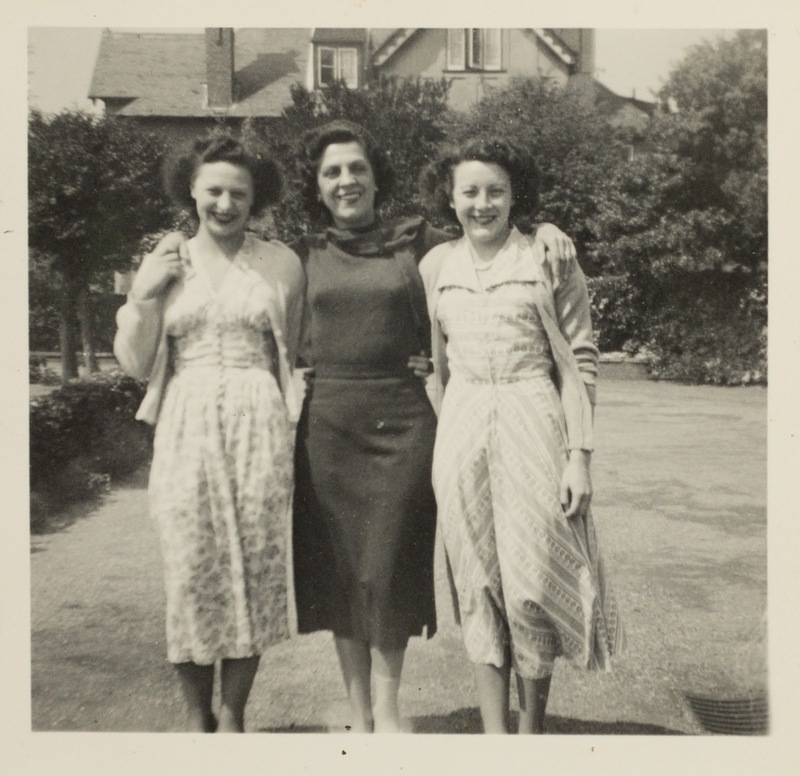 From left to right, Kitty, Kitty's sister Trude, and Kitty's twin sister Ethel. Trude, one of Kitty's sisters. Written on reverse, "Trude". Trude is standing with Hilda sitting across the table from her husband, René. This is likely Hilda's birthday. Written on reverse, "Cheesecake dessert. Candles came out peculiar! April 2nd, 1989." Best I can tell, from left to right, Jack, perhaps a son of Marie's, Hilda, Trude, Roy, Ethel, and Kitty. 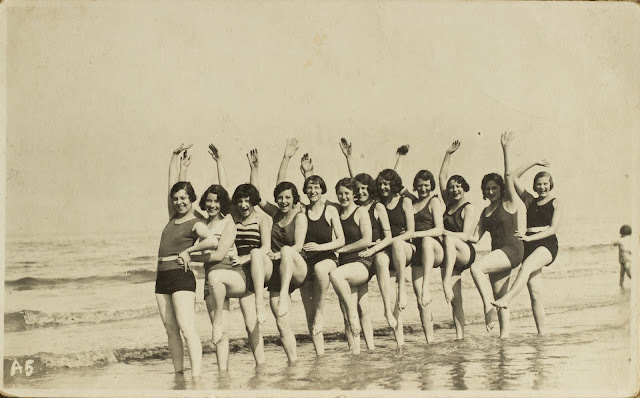 I'm not certain about the second row or the person in the foreground. 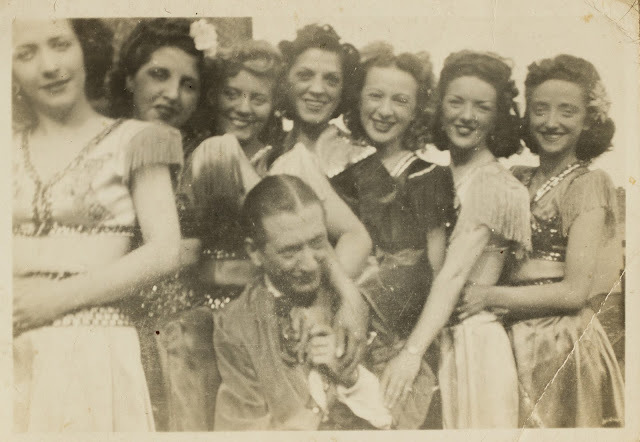 Best I can tell, from left to right starting with the front row, Ethel; Trude; Hilda; Hilda's husband, René; and potentially May. Second row, Kitty; perhaps a son of Marie's; Jack; likely Roy who is also a son of Marie; and perhaps May's husband. Scottie both performed with Kitty and was considered one of her best friends. Kitty on the right, likely her friend Scottie on the left. Photo by an unknown photographer. The two photos above and the one below all contain Scottie. 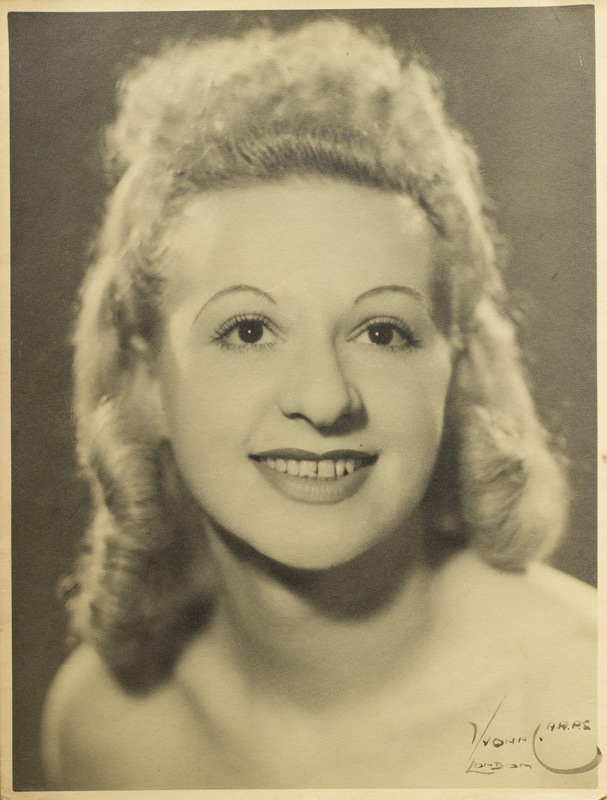 By the looks of it, she was still touring after Kitty had left in 1948. The man in the photos is Sam, who was Scottie's husband. Going clockwise starting with the photo in the upper left, going from left to right, Helen, Scottie, Sam, and Gladys, written on reverse, "Helen, Sammy, Gladys, and I. 1951". 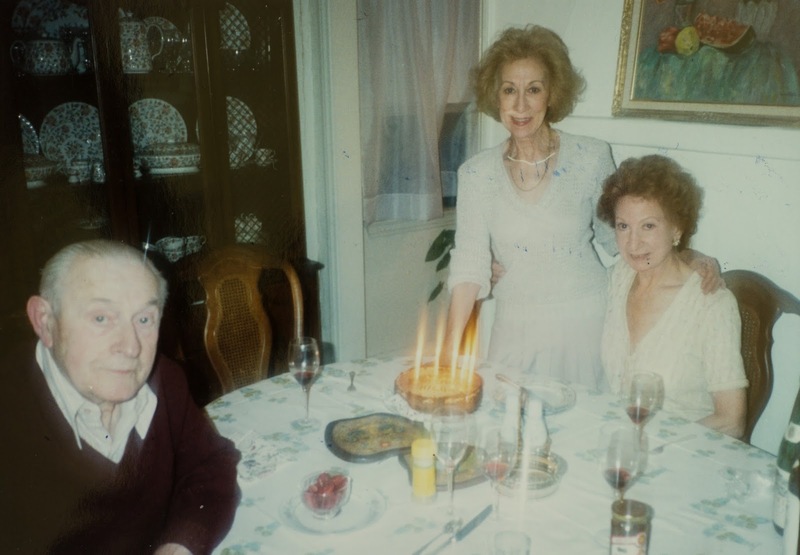 Scottie, "leading lady", and Sam, Scottie, written on reverse, "Sam and I with the leading lady. 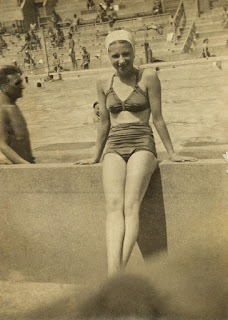 1951". 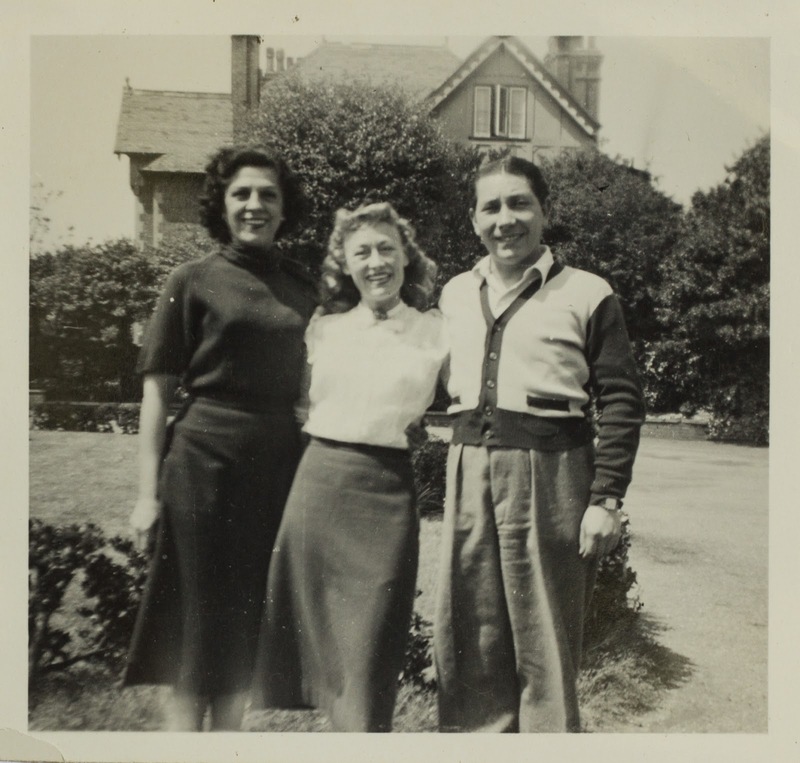 Gladys, Scottie, and Peggy, written on reverse, "Gladys, Peggy, and I. 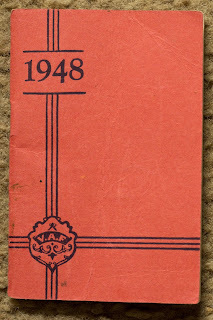 1951". Another from Scottie, likely after Kitty left for Canada. Written on reverse, "Love from: Scottie (The ...), Peggy (Belches), Bambi, Gladys (are you working), ... (Brown Boots), Patricia (Trouble)". Scottie is likely the furthest to the left, Gladys might be the third from the left. Photo by an unknown photographer. 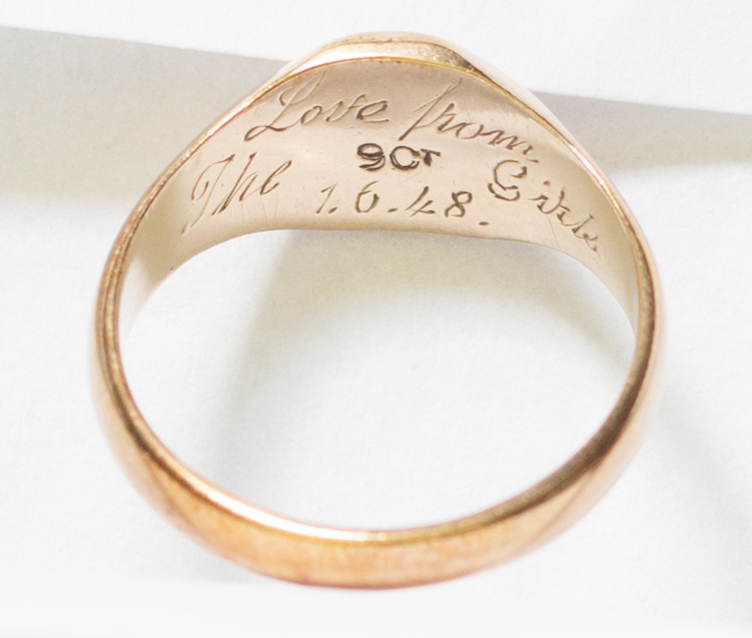 Before Kitty left England, her friends gave her this ring. Inside of the ring it reads, "Love from the girls. 1. 6. 48." I imagine that the "1. 6. 48." means "1st of June 1948", and that 1948, which was also the year of her unfinished Variety Artistes' Federation booklet, was the year she stopped performing and left for Canada to marry Harold. Photo taken by me. 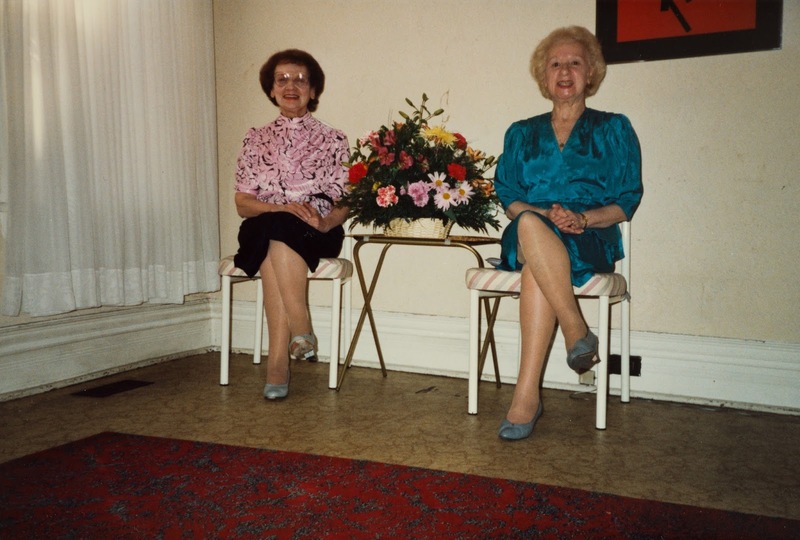 Isabel was Kitty's best friend in North America. She was the biological mother of my uncle, Bill, who Kitty adopted after Isabel died during childbirth. I was named after Bill since he unfortunately died in his 30's before I was born. 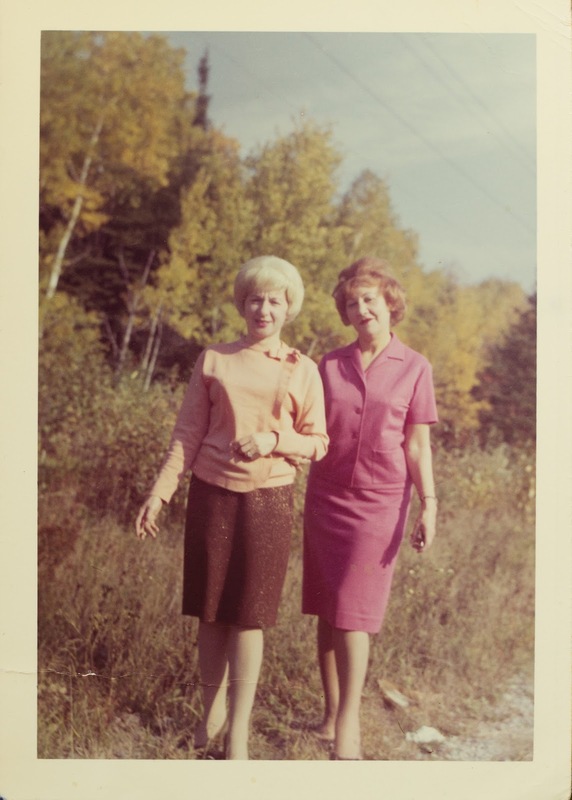 Written on reverse, "Isabel, she was a wonderful friend to me. She died in child birth. She had twins, Billy and I don't know the other twin's name, he didn't live too long." Both of the photos above likely include Isabel. They were likely both taken while on a day trip up to Lake Superior, north of Sault Ste. Marie, Ontario. 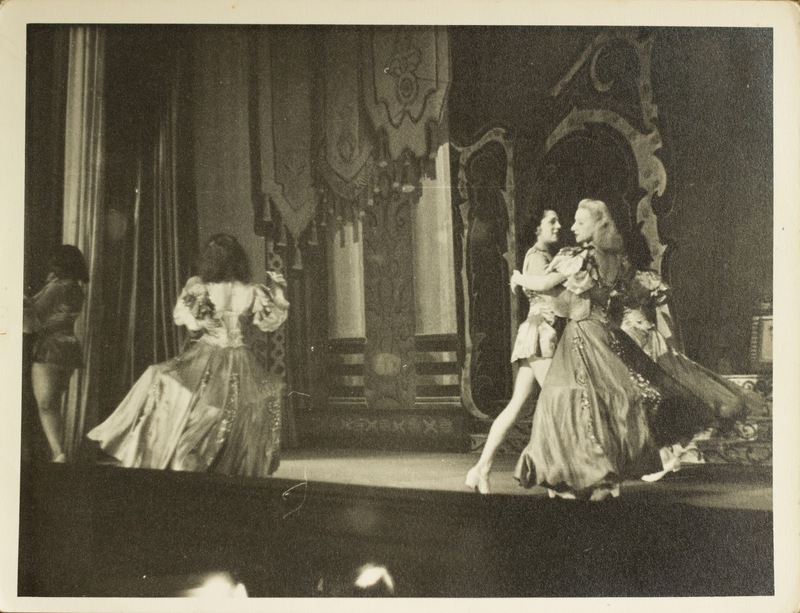 In the photo on the right, Kitty is likely on the right with Isabel on the left. Kitty originally left England to get married to a Canadian named Harold Myers. 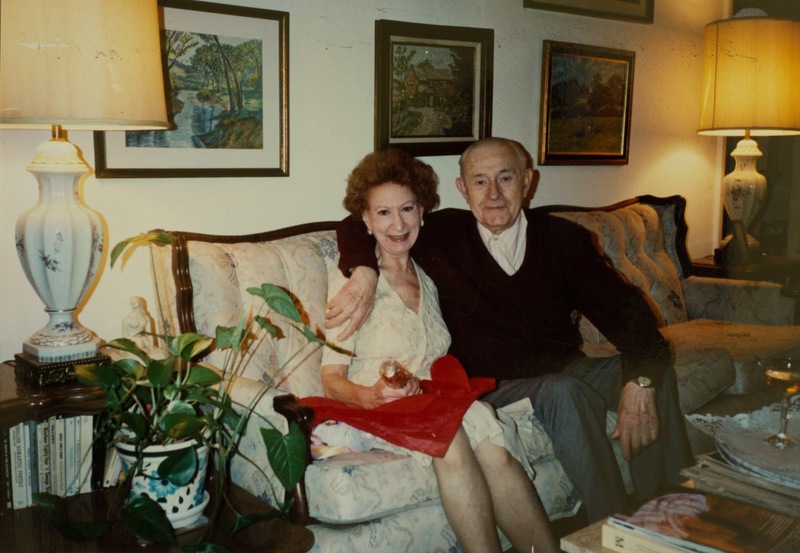 After he died of cancer 12 years later, she married Joseph McCandless. Kitty's rings. 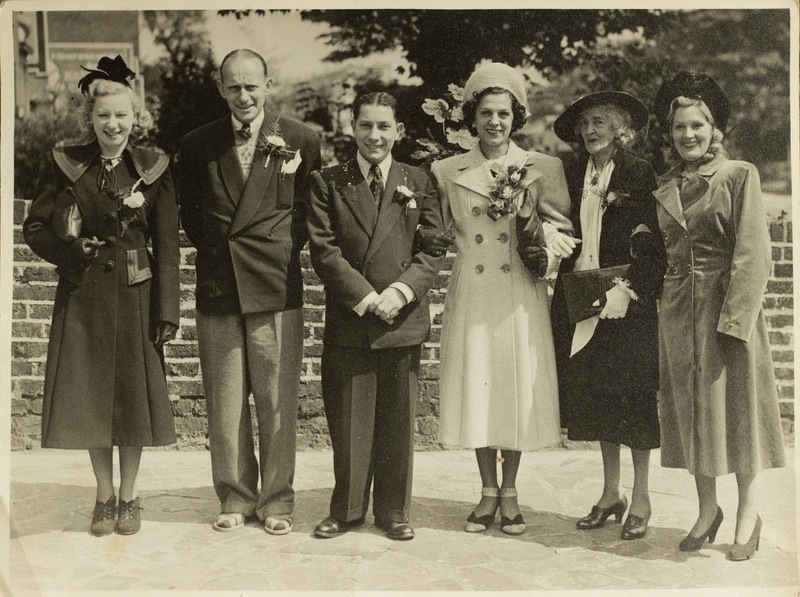 From left to right, a ring from her girlfriends before she left England; the ring from her first husband, Harold; a ring from the neighbour who fancied her; her second husband's engagement ring; and finally, her second husband, Joseph's wedding ring. Photo taken by me. 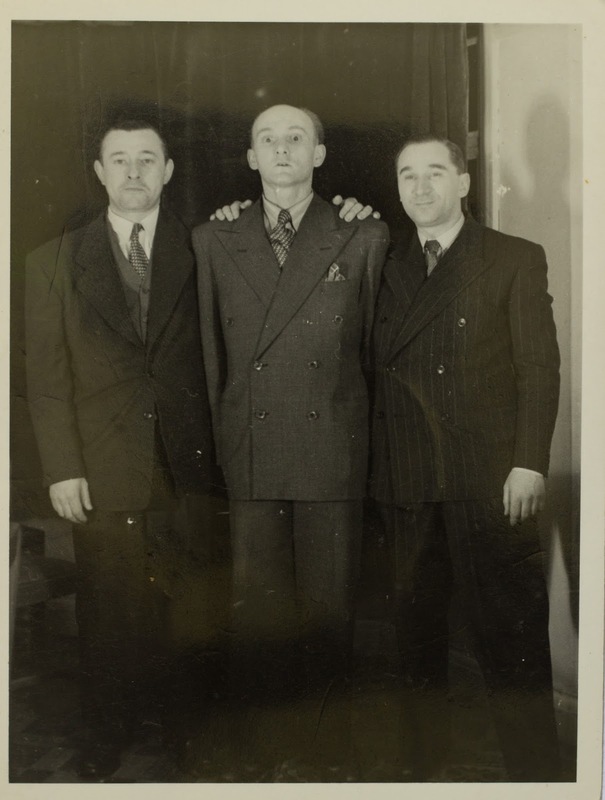 Second husband, on left, Joseph McCandless. Joseph McCandless again. He died just a few years after marriage due to heart disease. Kitty's glasses, the last prescription she had before she passed away. Photo taken by me. 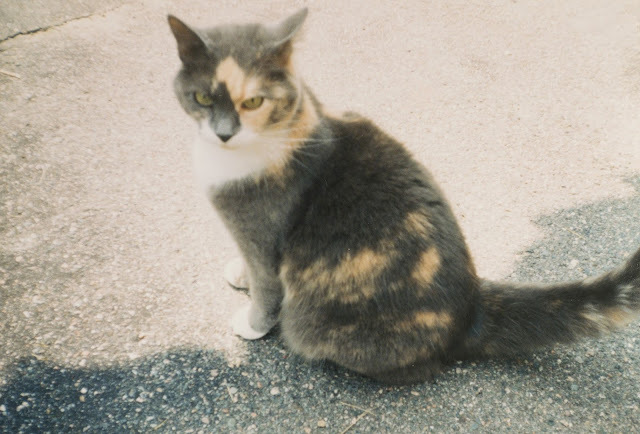 Cindy, Kitty's cat, who lived with her for as long as I can remember, up until a few years before her passing. The camera Kitty bought in Hollywood, California when she went to visit her sisters Hilda and Trude, who had immigrated there. 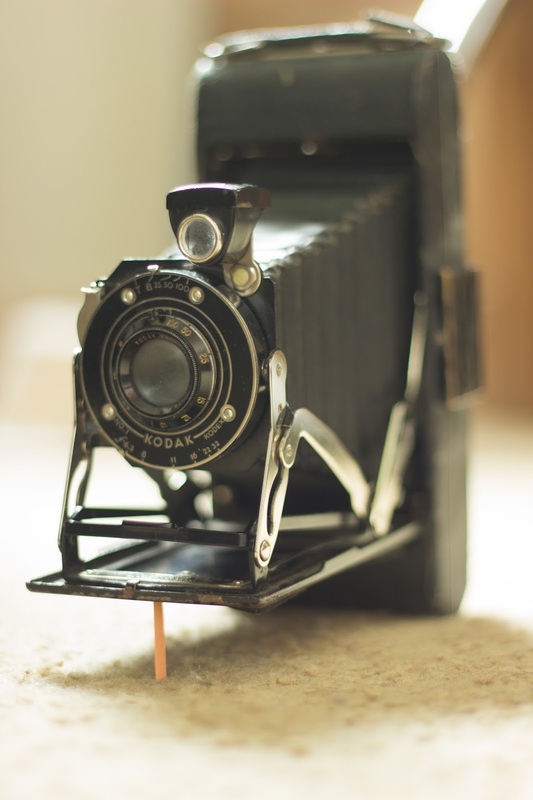 The camera is still capable of taking photos, although the shutter is sticky. I've been able to take a couple of nice long exposures at night with it. Here's one. Photo taken by me. 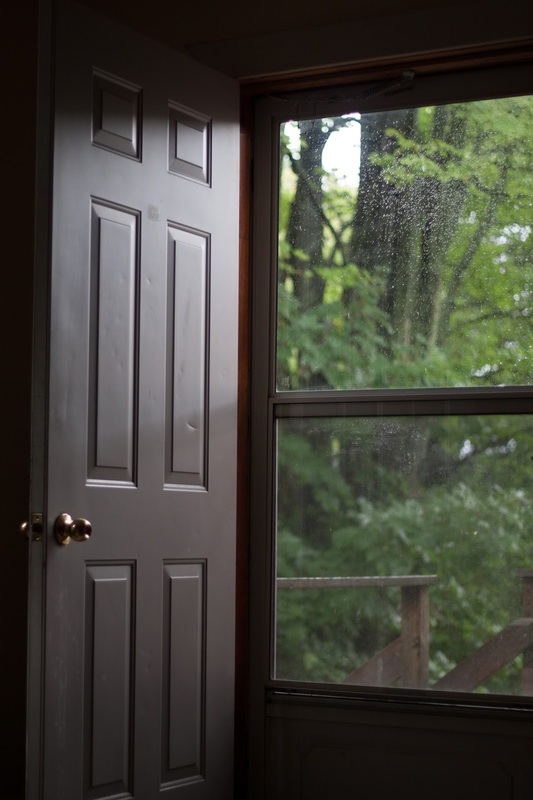 The door to Kitty's second last apartment. Photo taken by me. In this section I largely share Google Street View screenshots of significant places that Kitty has been to. The neighbourhood Kitty grew up in. She might have been raised in the apartment block to the left. These apartments were originally constructed during the late Victorian days as one of the world's first modern social housing projects. Today, due to the closeness of the area to central London, it is a pricey area. Image via: Google Street View. 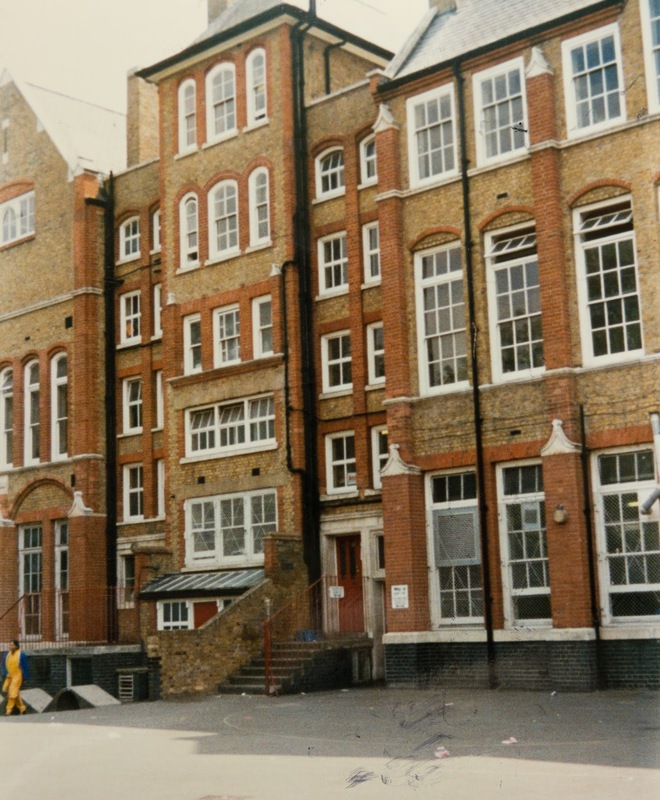 An old photo of Virginia Road School. Kitty attended this school when she was very young. What Virginia Road School looks like today. Image via: Google Street View. The London Palladium, one of the most famous venues that Kitty performed in. It is said to be the most famous theatre not only in London, but in all of the United Kingdom. Many famous people have performed here and the venue holds the record for the greatest number of Royal Variety Performances held in any theatre. Image via: Google Street View. The Phoenix Theatre in London, England, another place where Kitty performed. Image via: Google Street View. Casino de Paris, Paris, France. 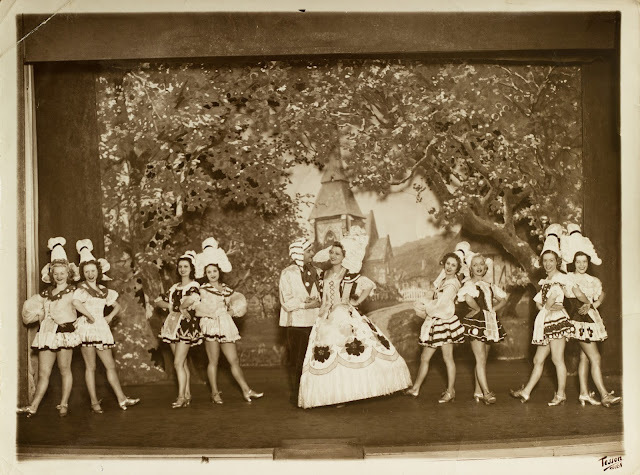 Kitty lived in Paris for three-and-a-half years and performed here steadily. Image via: Google Street View. In having put this article together, I've learned so much more about my grandmother. I feel as though she lived a pretty interesting life and I mean for this article to be a way to remember her and share her life's story. If anyone has any more information or concerns regarding the information in this article, you can contact me through my site.